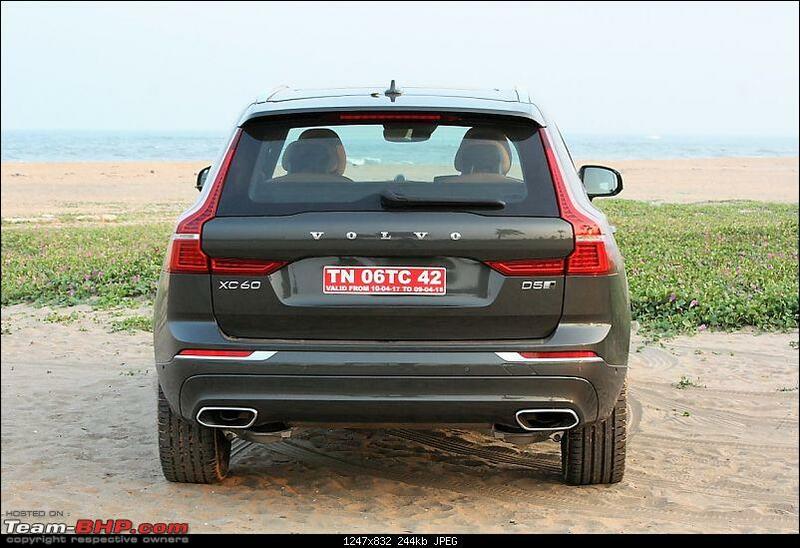 The Volvo XC60 is on sale in India at a price of Rs. 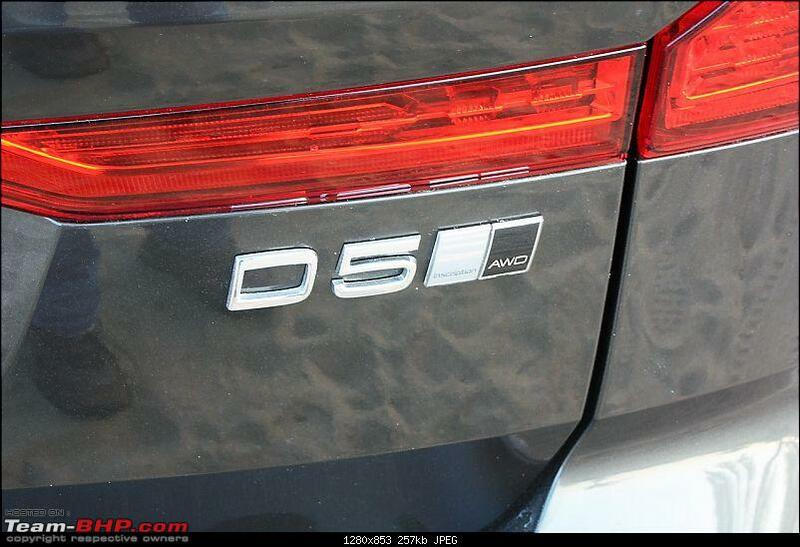 55.90 lakhs (ex-showroom, India). • Very well-priced, especially for a CBU! Last edited by Aditya : 21st February 2018 at 10:43. Last edited by Aditya : 21st February 2018 at 10:58. 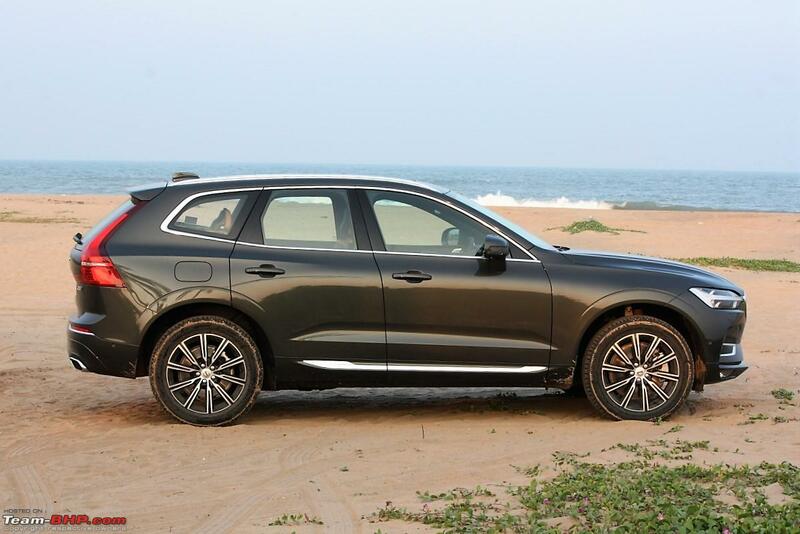 The XC60 is a very important model for Volvo globally and even in India, it garners about 30% of the total sales numbers. 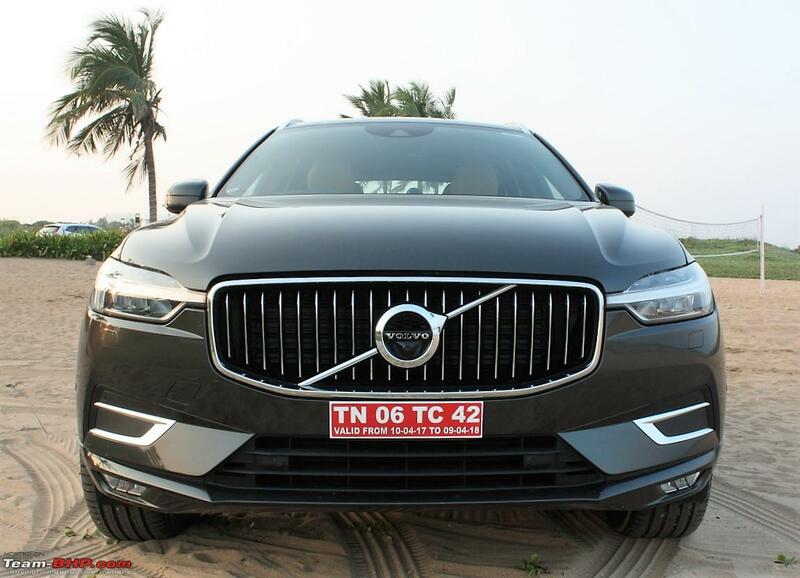 Volvo’s plan is to grow volumes by another 20-30% in the coming year in India and it expects similar growth for the XC60 (compared to the outgoing model). Profit numbers have been good for Volvo worldwide - $3.5 billion last year is something of a surprise when you look at the struggling industry in general & the poor position Volvo Cars was in a couple of years ago. 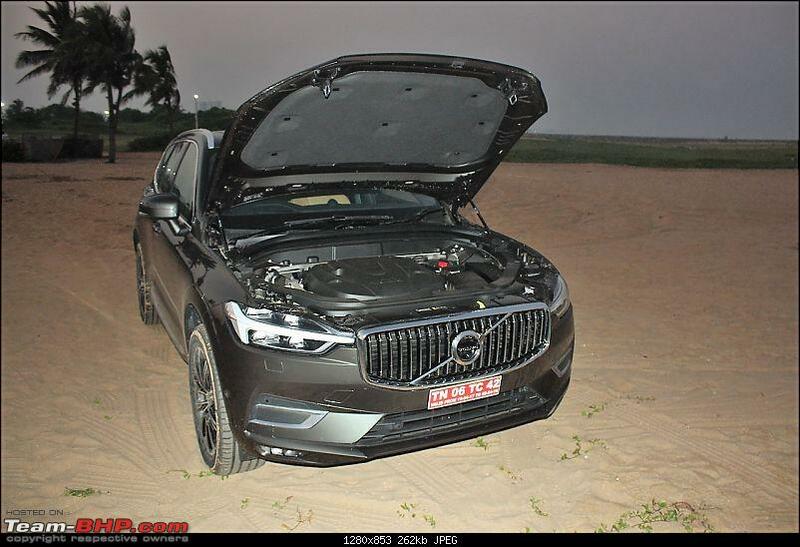 It is of no surprise then to see that Volvo did not wait for the CKD assembling plans to be in place to make this launch. The segment has been heating up with competition launches, and some more are around the corner. Moreover, the priority for CKD production still remains for XC90, where the demand is yet to be met and the margins are much better. Launch of a CBU unit is then obviously a numbers game and Volvo is confident that they can roll out a CKD model within a couple of months, if there is a need to do so. 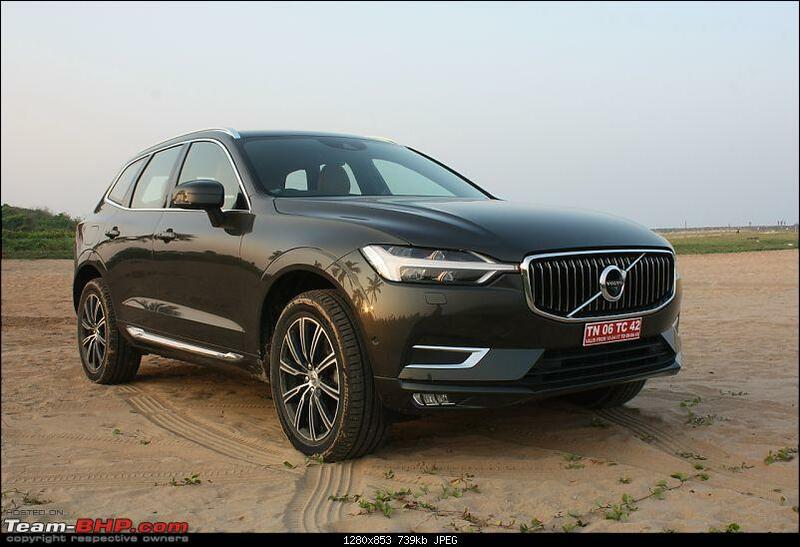 The model being launched in India would be the second generation XC60, internationally launched in June 2017. 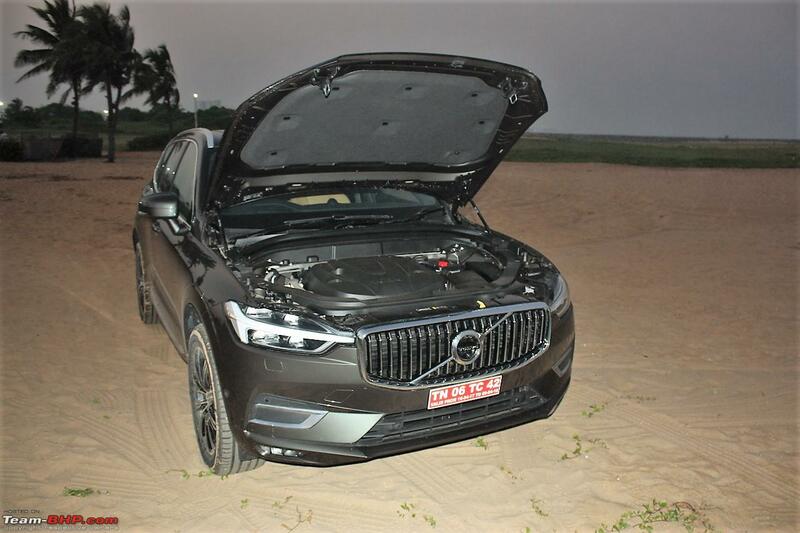 There are multiple power options and trims available for the XC60 internationally, but in India, only the top end Inscription spec with the D5 diesel motor is being planned for now. 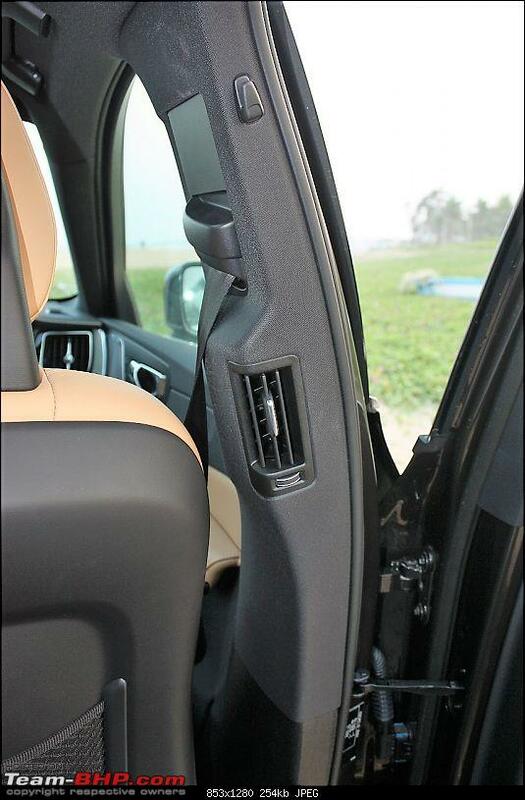 There are multiple colour choices being provided for the interior trim, and there are NO hidden cost cuttings here. Metros are the big focus for Volvo. The business model is such that, existing dealers are given preference for opening new locations within a particular state. The design philosophy at Volvo has been evolving well and the changes are quite visible with each new launch. This excellent post by Ajmat in his S90 review has captured it well. 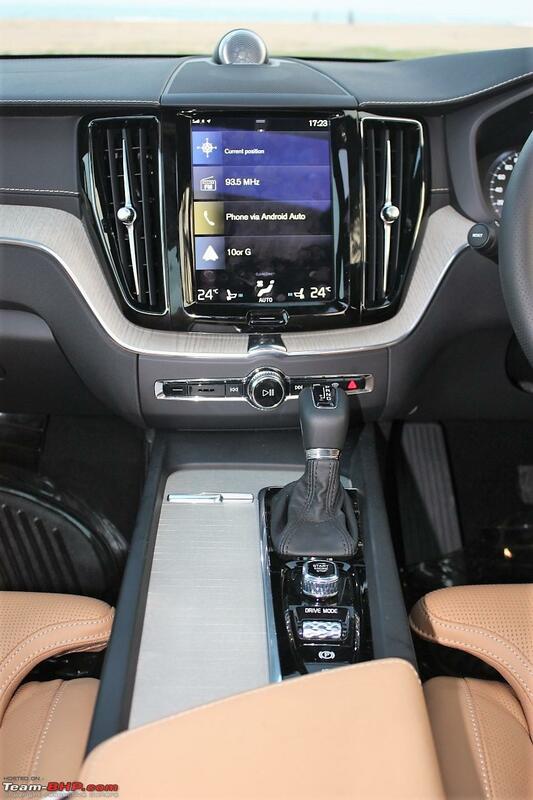 The XC60 is based on the “ground up new” Scalable Product Architecture (SPA) and Compact Modular Architecture (CMA). The latter gives it a scalable platform to accommodate future hybrid options easily. The new XC60 is longer, wider and shorter in stance compared to the outgoing model, which translates to more space internally and stability dynamically. The XC60 definitely looks like a miniature avatar of the XC90, but in person, I felt the XC60 had a more planted character overall. There are 4 colour choices at launch - Pine Grey (New shade), Crystal White, Onyx Black & Maple Brown. 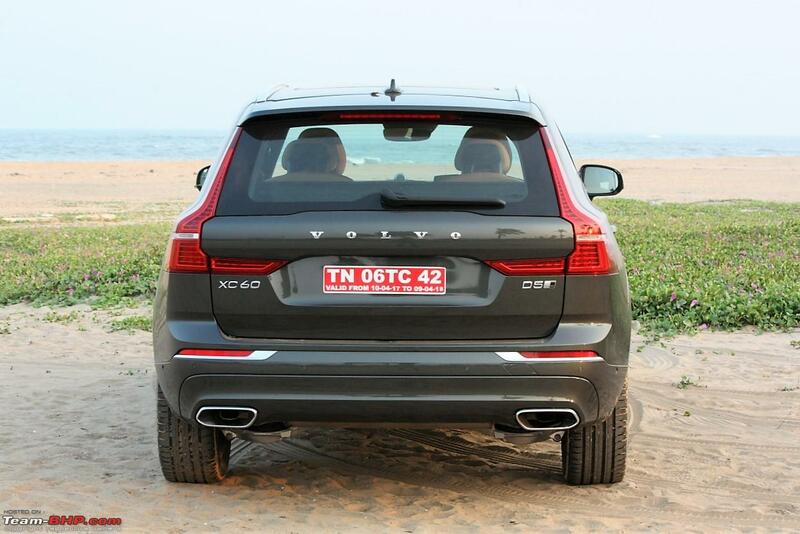 The car looks sharp from the front and sides; only the traditional Volvo rear end will draw mixed emotions. 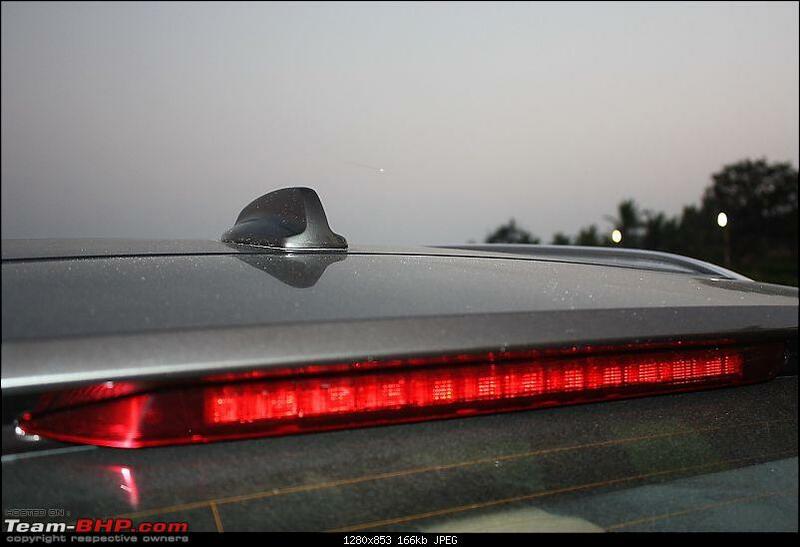 I liked those tail lights, which once lit up change the character of the car. The proportions are tighter overall and the SUV does not look gargantuan on our roads (like it's elder sibling does). 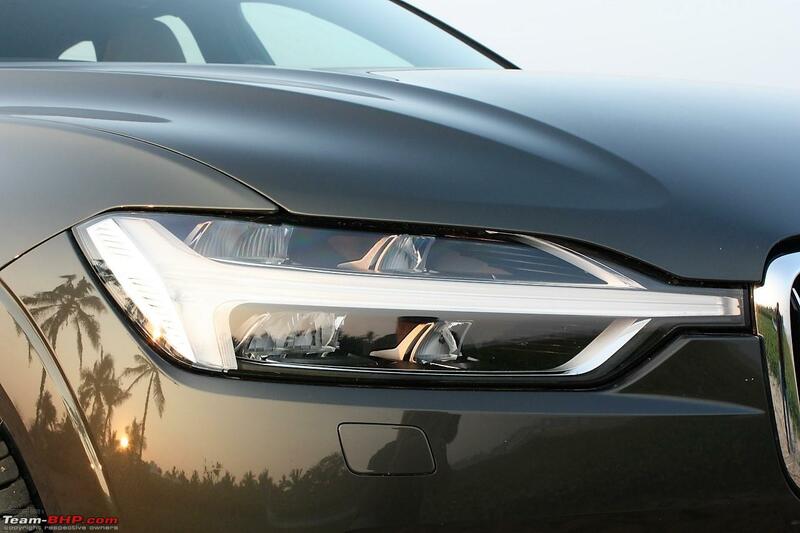 At the front, the design change one would take notice of most is the 'Thor’s Hammer' full LED headlight system. 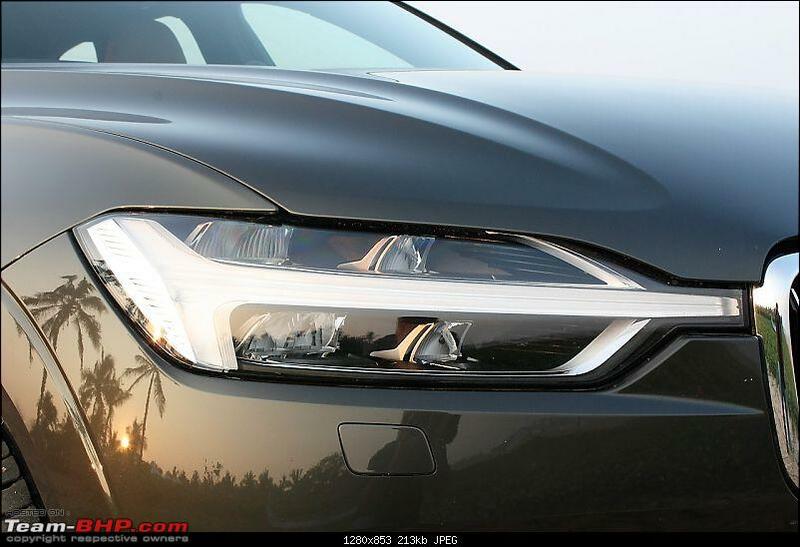 The edge of the headlight now extends further and touches the central grille (neat according to me) vs. the smaller hammer head design in other models. 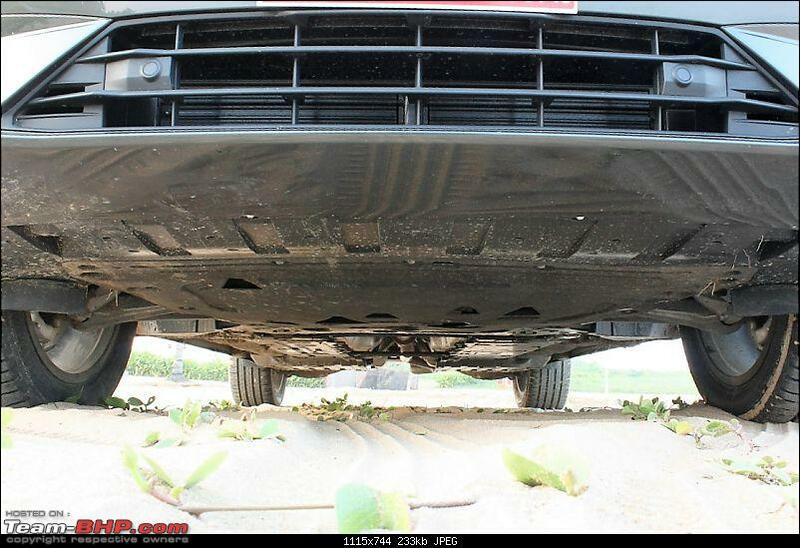 You can see the solid aluminium arms with air suspension bellows sitting in between them. Always wondered if they are safe from our rodent menace!! 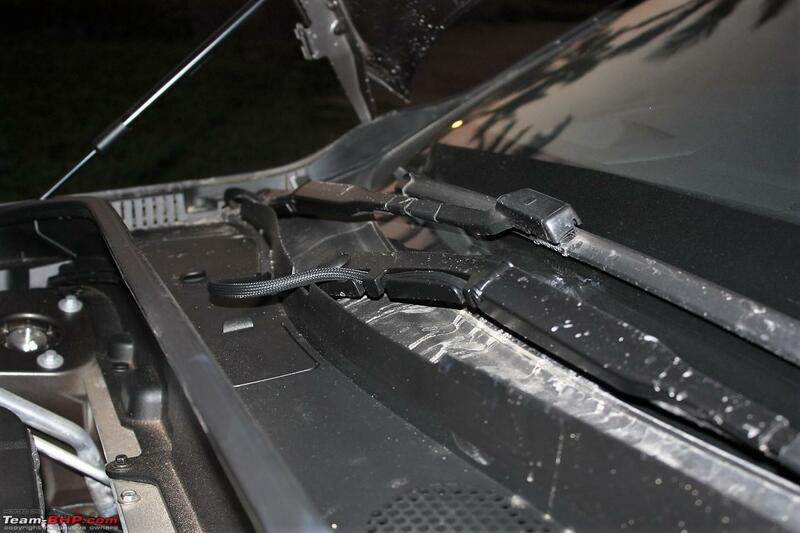 But when you really want to jump inside and see what is happening, the hood can be further pushed up like this! Last edited by Aditya : 21st February 2018 at 10:44. 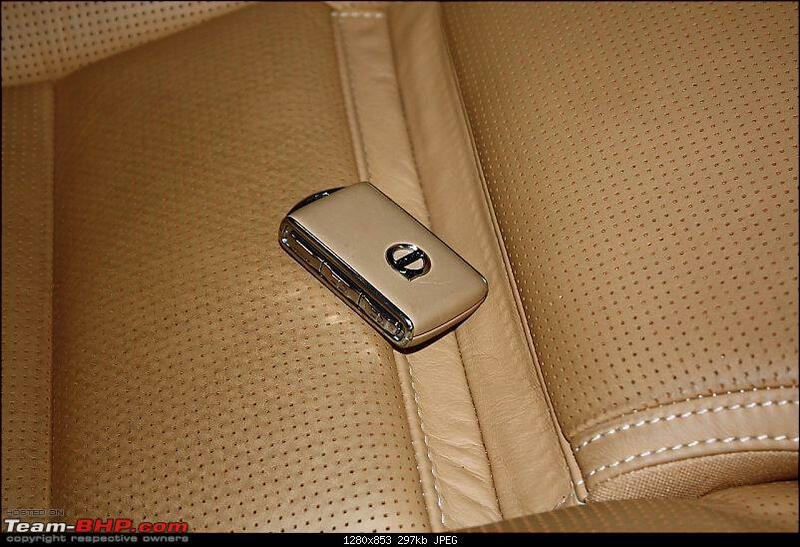 There are three colour options available (Amber, Maroon Brown & Beige) for the leather - a great way of making the car appeal to varied tastes. Having said that, the booking experience on Team-BHP has been mixed so far, with dealers not being able to guarantee delivery of the customer's choice, and these choices being used as a bargaining option for the delivery wait period. Quality of materials is up there with the best and there are very nice touches that give the interiors a very upmarket feel. 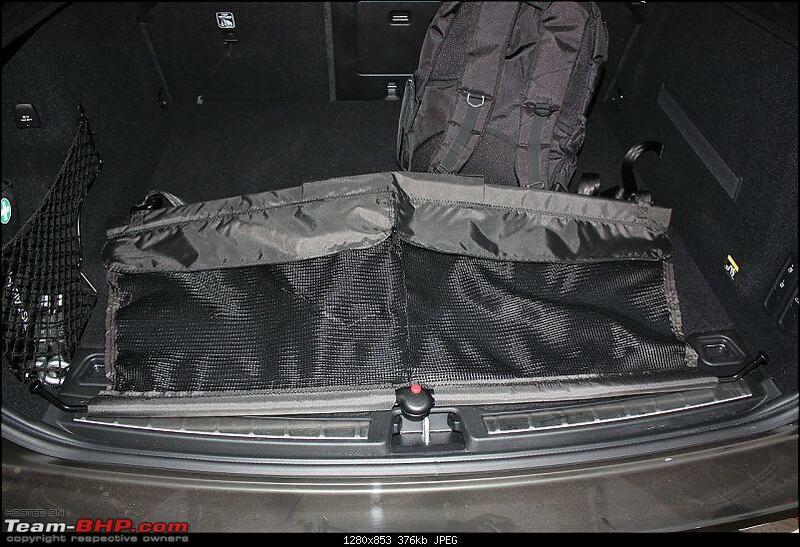 I personally love the black roof liners and carpet used (easy to maintain + a sporty look). 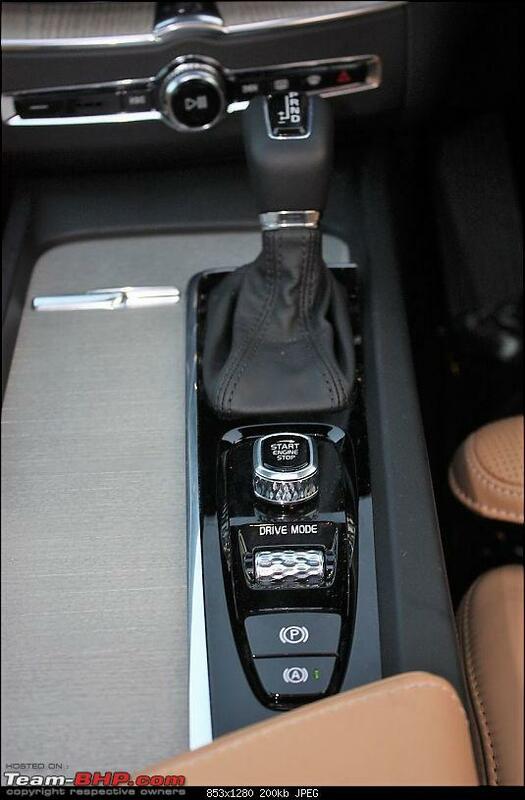 Switchgears, the various knobs & buttons, the paddles all feel very premium. 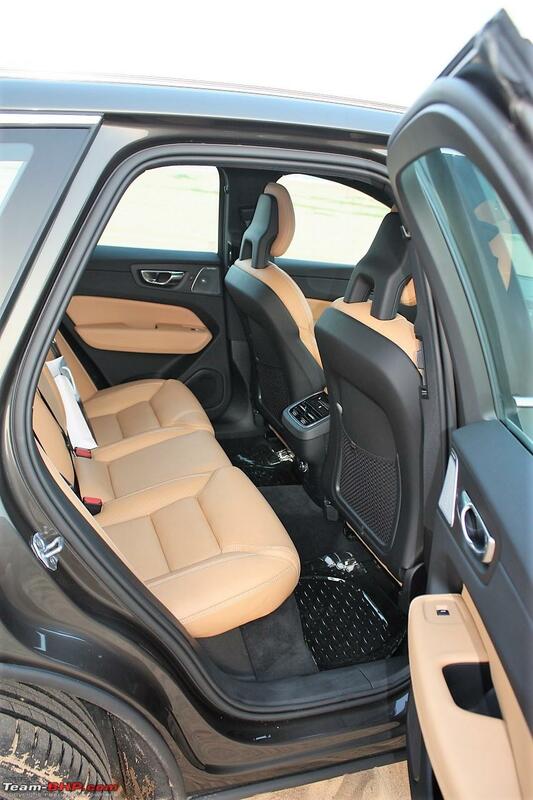 Kit includes leather on the dashboard, Nappa perforated leather seats, fully electric front seats with Heating as well as Massage functions, powered thigh extensions at the front, powered rear seat backs and headrests etc. 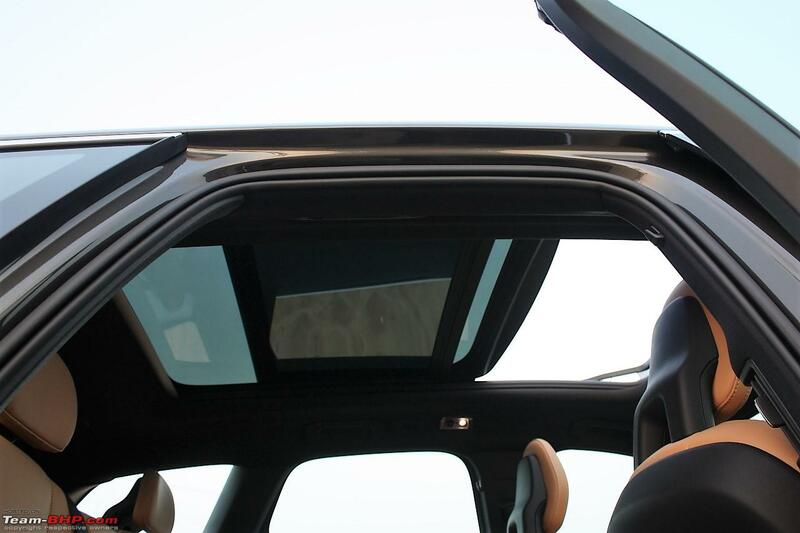 The car comes with an electrically operated panoramic sunroof system, but only the front half of the roof can be slid back to reveal the sky light. Looking at the dashboard, the first thing that strikes you is the minimalist look and feel, which makes it seem elegant. The driftwood insert that runs across the centre is classy and together with the dash of satin chrome on the air vent gives it an opulent feel. 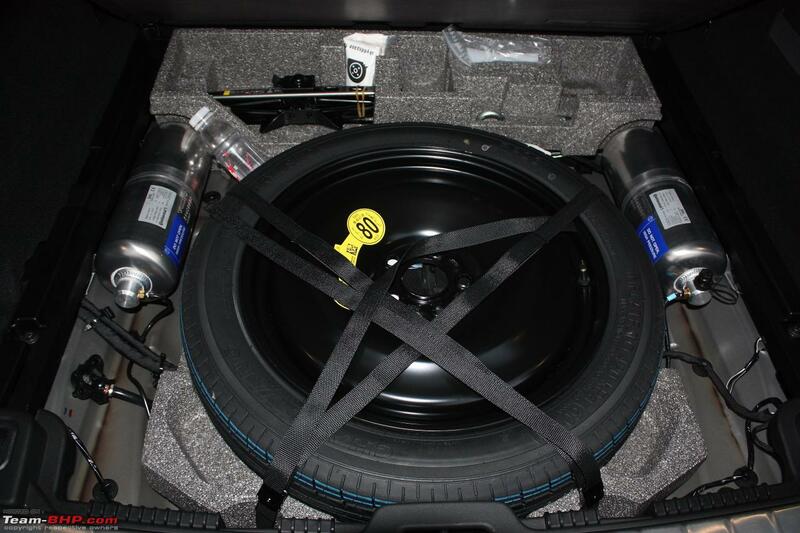 The central soundstage speaker and the woofer grill of the 15-speaker Bower and Wilkins sound system dominates the top of the dash. 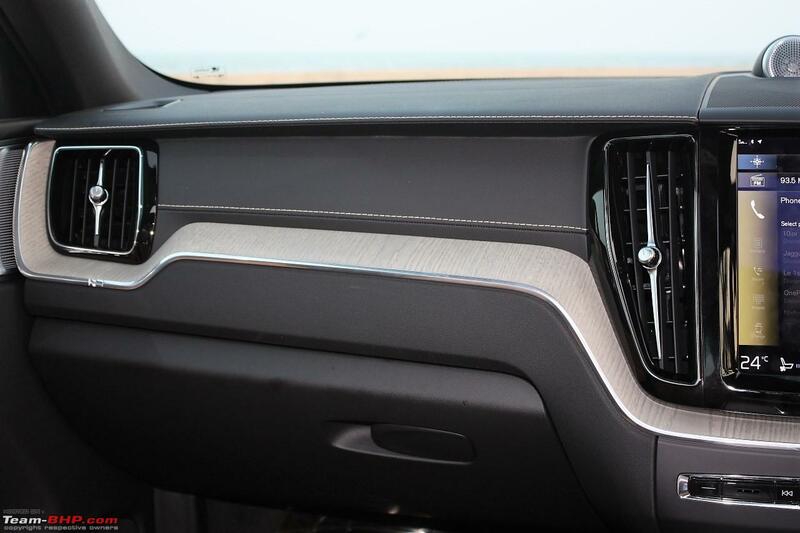 Newer generation Volvos have large touchscreen interfaces that control most of the features in the car and the XC60 is no different (has the same touchscreen that comes in the XC90). I had my apprehensions at first; a predominantly touchscreen-based control system can make it quite cumbersome to use, in comparison to the traditional switches and knobs that we are used to. Having spent a few hours with this car, I came back with a very different opinion. In the centre sits a large 9-inch central display with some shiny black bezel around it - one can say this is the 'master control' for the ship. 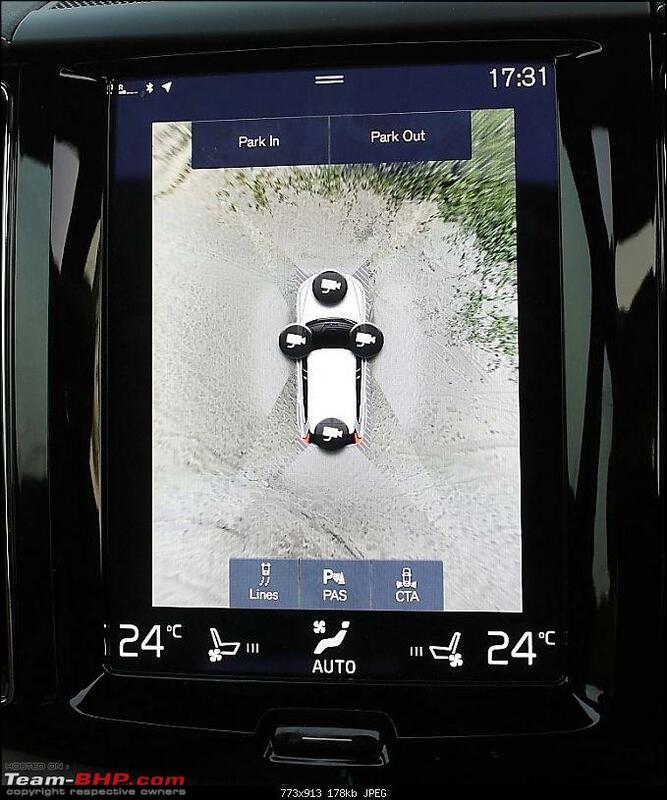 Almost every function right from navigation, climate control, audio, mobile device access (Apple CarPlay / Android Auto), various settings for the car and even the user manual are all accessible here. Display clarity is very good. It works on soft touch and is one of the most responsive systems seen in recent launches. 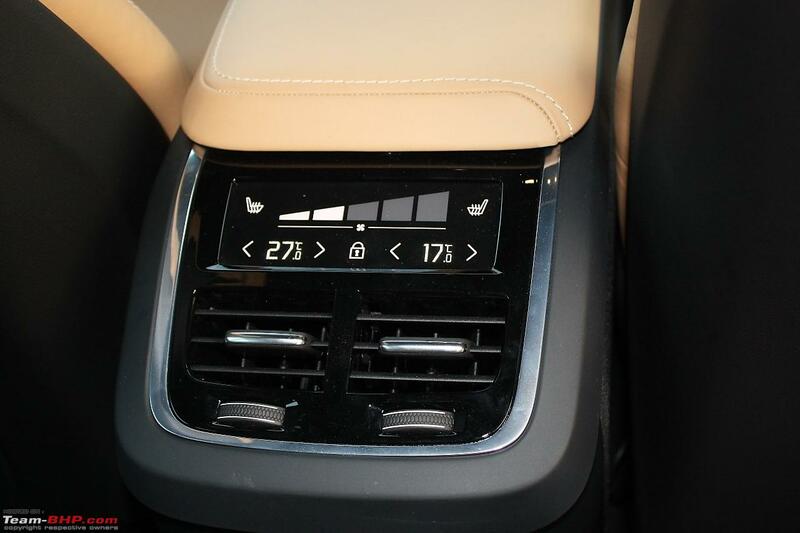 The climate control gets a dedicated area at the bottom of this large screen and is again very intuitive to use. At the bottom centre of the screen is a physical 'Home button' for the system (similar to smartphones). Right below the central display area sits a set of physical buttons and a large knob, mainly for controlling media, the defogger system and activating the hazard warning. Gone are the days of traditional meters, everyone is going graphical, especially in these premium cars. Left side has the speedo calibrated to 260 km/h, and the right has the rpm with redline starting from 4,800 rpm. Fuel gauge is smartly placed below the rpm meter. 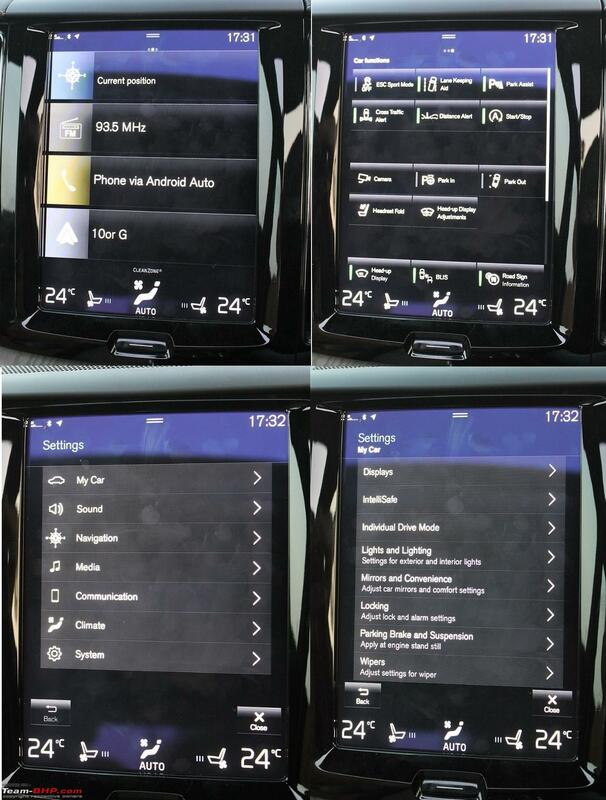 There is a small area running right across the bottom that displays all sorts of other information like cruise control, trip related data, odo, fuel efficiency etc. This small band at the bottom of the console could have been better implemented. It looks quite busy and the way in which it superimposes over the speed and rpm displays further adds to the clutter. 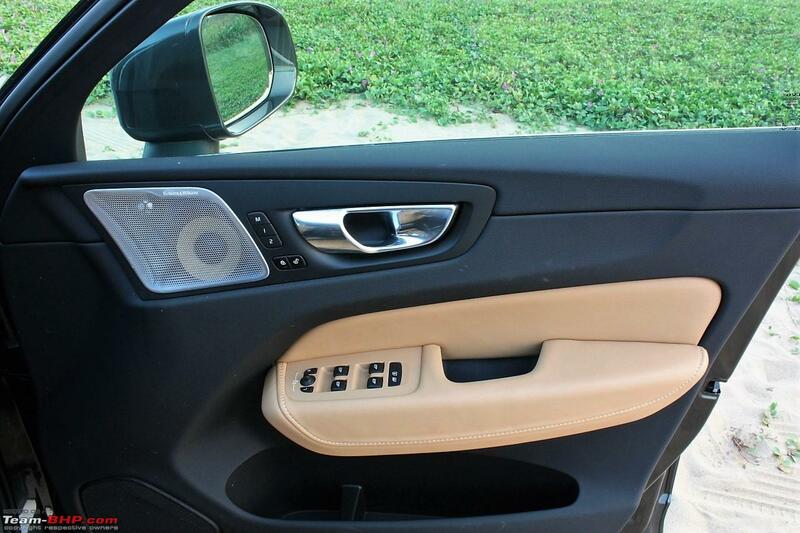 The space between the two large dials is kept for displaying information on navigation, media (while on the move) and door ajar warning (when stationary). The red driver seat indicates the seatbelt being unbuckled - very cool!! Last edited by Aditya : 13th March 2019 at 10:12. 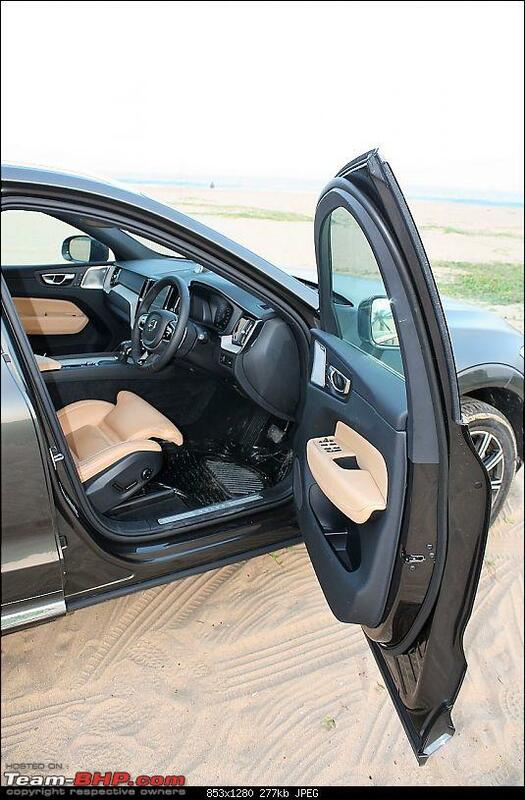 The rear seats offer satisfactory comfort and the cabin is wide enough to accommodate 3 adults. Seats are supportive (similar to the front seats) and the angles are just right for those long journeys. Cushioning is on the firmer side and offers good bolstering (including under thigh). 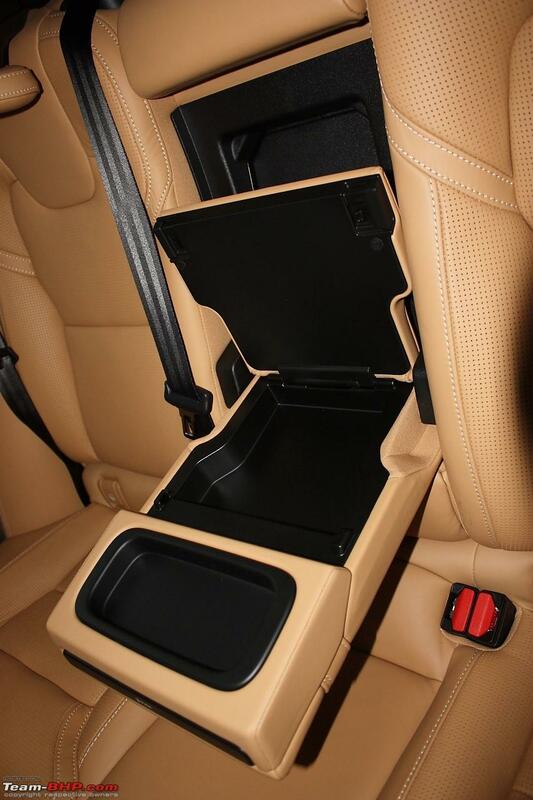 The front seatbacks are covered in hard plastics though (including the neck restraints). Another downside is that you only get a netted storage pocket. Still, the biggest let down at the rear is the central tunnel's height which will accommodate a plug-in hybrid system in the future. It takes away a generous amount of space for the centre seat occupant. 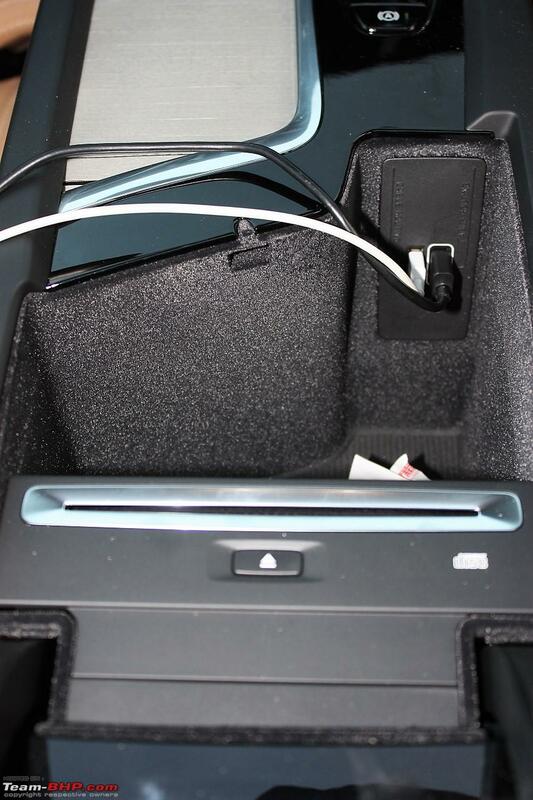 The rear seat base has been sculpted inwards at the middle to compensate for the central console projection, yet this does not help much in real life while moving in and out. Since the height of the tunnel is really tall, unless you are a yoga guru, getting in and out of that middle spot is going to be a really time consuming exercise. Longer journeys also would be uncomfortable if you are an adult at the middle. 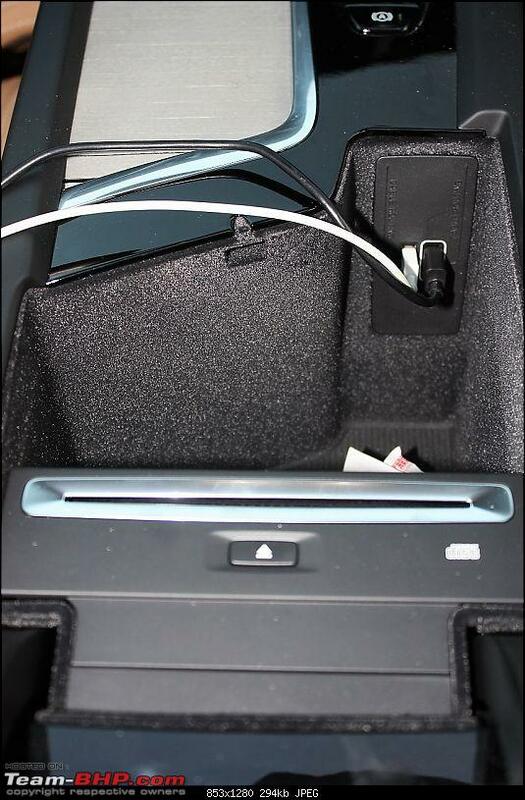 The rear seat has ISOFIX mount points for child seat attachments. Last edited by Aditya : 21st February 2018 at 10:45. If you have been following automotive news, you would have read that Uber has placed orders with Volvo for it’s autonomous driving cars. Volvo has been developing many technologies for autonomous cars and claims that it is even ready with a production line for the Uber order. This is good news for retail customers since Volvo has been offering scaled down versions of these technologies, mostly to make cars safer. 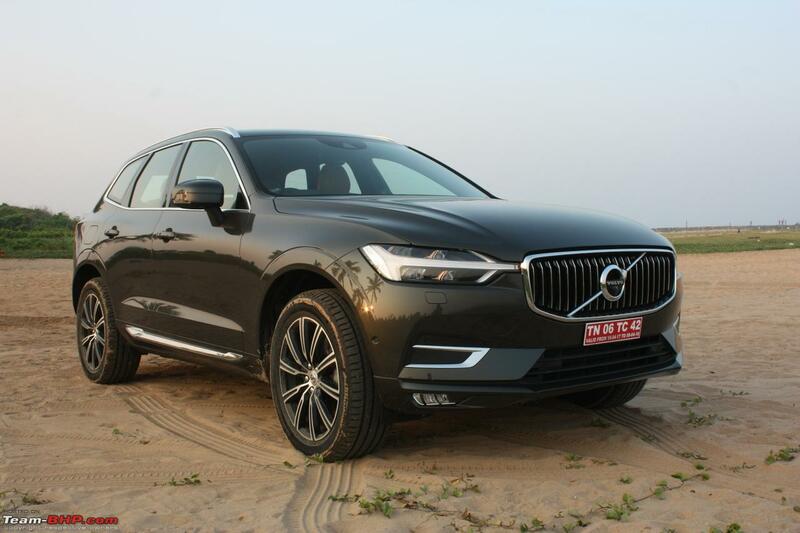 The previous generation XC60 already had some of these aids and in the latest release, most of these have been upgraded for greater tolerance + working at higher road speeds. 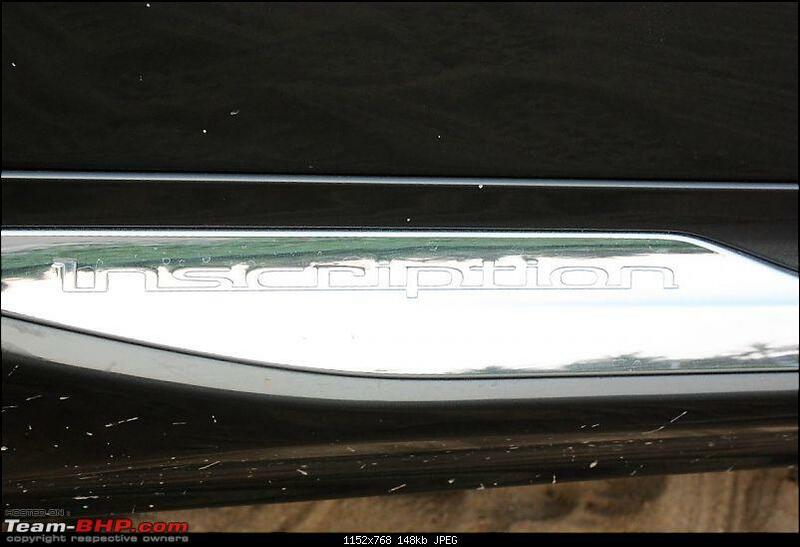 The top end Inscription model being launched in India has a bunch of these underneath and the ones that have an impact on driving experience have been listed out below. 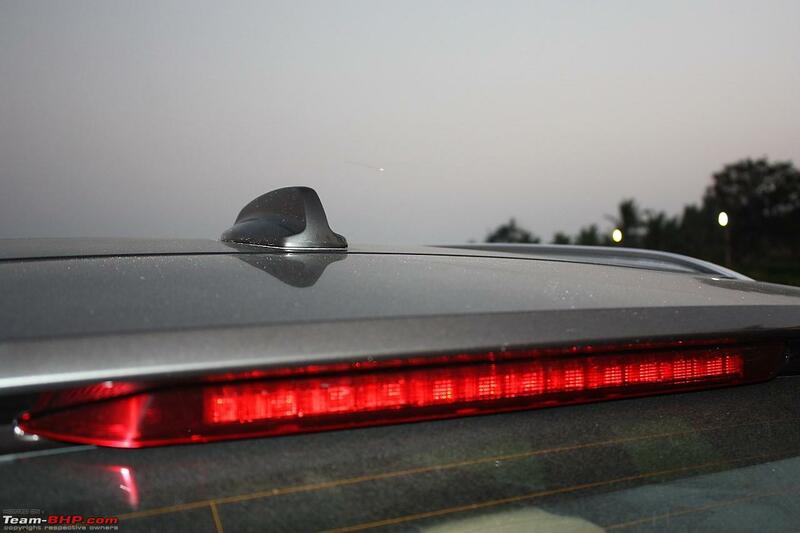 Most of these features work using radars and sensors, and radars meant the need for government authorization to use the frequency on Indian roads, since they are tagged as sensitive resources. 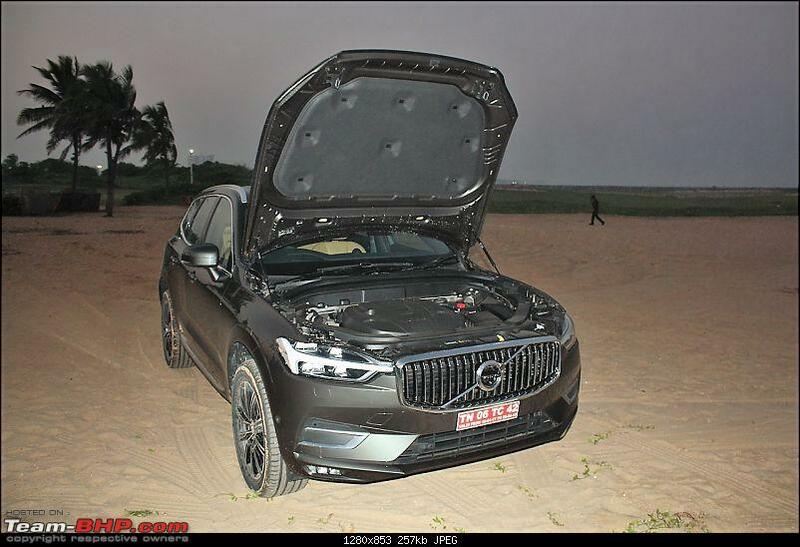 The Indian government recently gave all the clearances and the XC60 has all features activated for India - 100% identical to the cars that are sold internationally. 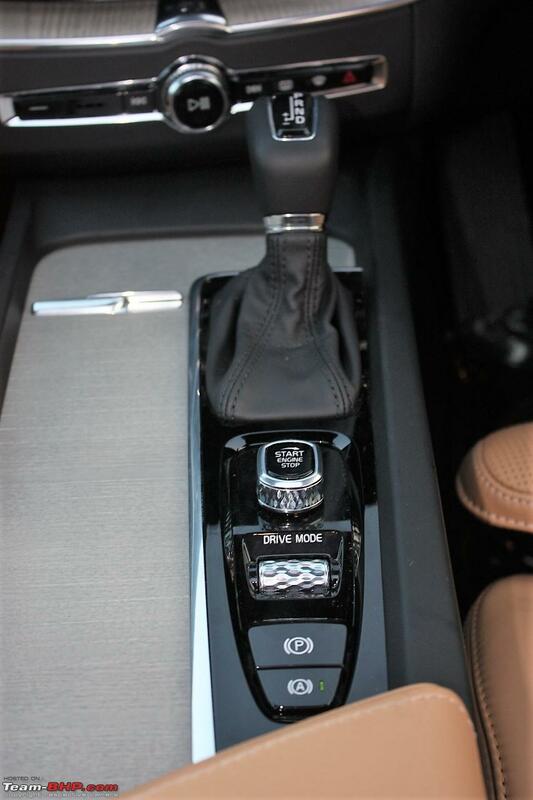 We all know how a regular cruise control works - the user sets a particular cruising speed and the electronics take over to keep the vehicle at the set speed. This is a super useful tool for folks who do a lot of long highway driving. But in India, the experiences vary a lot and only if you are in a properly barricaded 4 or 6-lane highway, you can pull it off without a struggle, that too in moderate traffic. The moment someone ahead slows down or decides to cut across, the driver is forced to press the brake and that will cut off the cruise control in most cases. 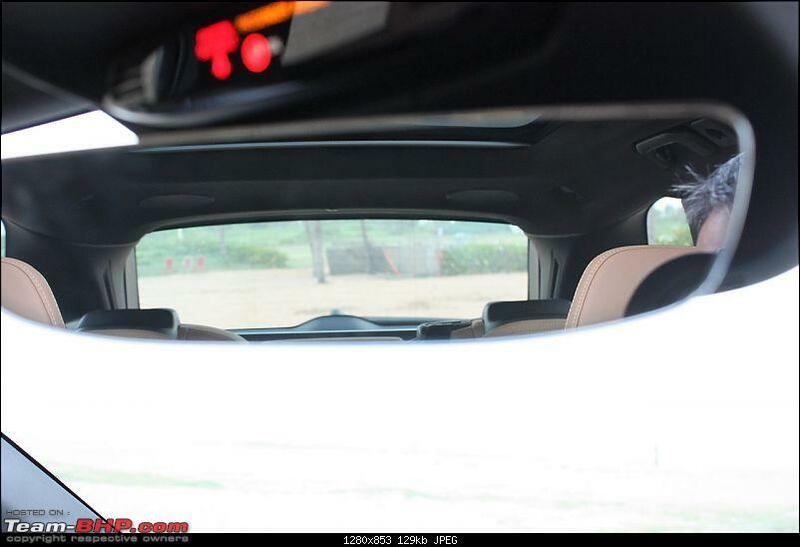 Now imagine using the cruise control on a two-lane highway in India – the lesser said the better! With oncoming traffic and crazy overtaking manoeuvres, the system becomes pretty pointless. Imagine a scenario where the car figures out all these difficult situations on its own, and then adapts to it. This is Adaptive Cruise Control. It is as easy as setting the required max speed first and then the minimum distance that you would want to keep between yourself and the vehicle ahead. Then, just sit back and steer the vehicle and let the car take over the remaining controls. 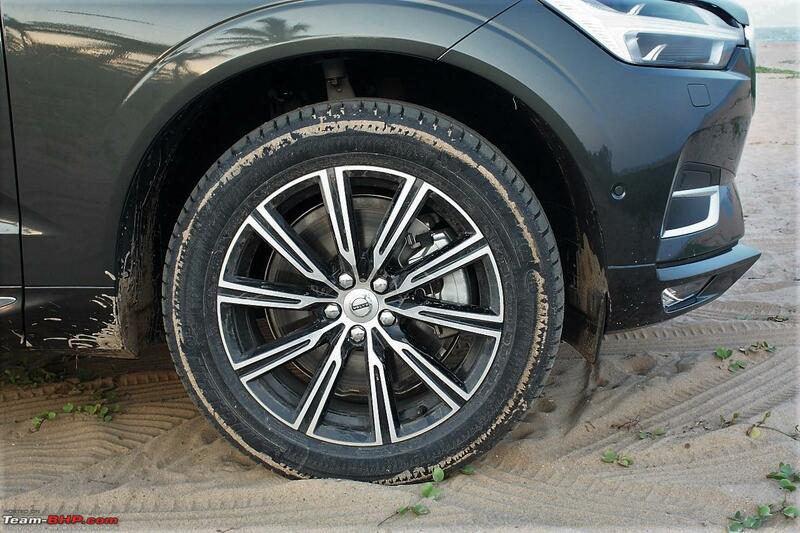 If the vehicle ahead slows down, the XC60 will reduce the speed on its own and when the vehicle ahead accelerates, your vehicle would also increase the speed, all the while maintaining a safe braking distance for the speeds being travelled at. 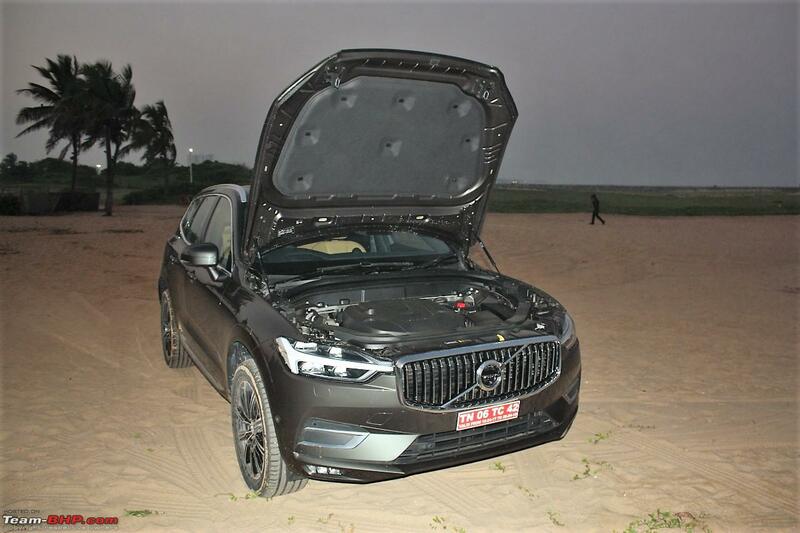 Version 1 of this system was conservatively tuned and would work only till about 60 km/h, but the updated version that comes in the current XC60 is improved and supports speeds upto 100 km/h. Now let us complicate the above scenario, where the vehicle is approaching a very slow moving vehicle or getting into a long queue on the highway. What if the car can steer itself, while keeping the speed and distance safe? Voila! Here comes the Pilot Assist mode. Engage the adaptive cruise control and when you get into a situation where you have a large queue of slow moving vehicles that requires lot of patience, you just set the system to pilot assist mode and then... sit and relax. The car would do the required work for steering the vehicle and maintaining a safe distance ahead. Smart or what?! Once the situation eases up and speeds pick up, the system would automatically increase the speed and hand over to the adaptive cruise mode. 1) You have to be in the adaptive cruise control to begin with. 2) Roads need proper side / lane markings (not at all consistent in India). 3) Speeds should be under 50 km/h. This is NOT a completely autonomous mode, don’t assume that you can take out your smartphone and start reading to let the car drive on its own. 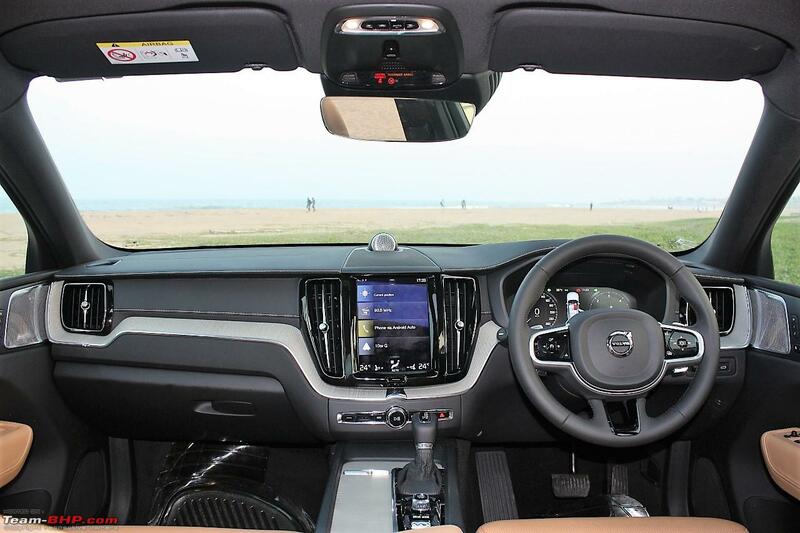 The system will give warning signals if the driver takes the hand off the steering completely for more than 10 seconds, or if it detects that the driver is inattentive for a similar period. There are cheats to override this, but definitely not recommended since it is a very unsafe thing to do on public roads. Test drive being on East Coast Road (outside Chennai) that has good lane markings with barricades on the sides most of the way, it allowed me to play with adaptive cruise control and even have a small go at the Pilot Assist mode. The system was not engaging initially, until I figured out that one needs to activate it under the settings before the options pop up on the steering wheel control. Check the brilliant videos below to understand more about these features and their real life usage. As the name suggests, this is nothing but assistance to keep the vehicle in the lane it is using. The radars keep reading the markings and will interrupt with a small judder on the steering wheel if the vehicle is moving out of the lane it is travelling in. It works on straights as well as on curves and even passively turns the wheels to keep the vehicle on the right track. 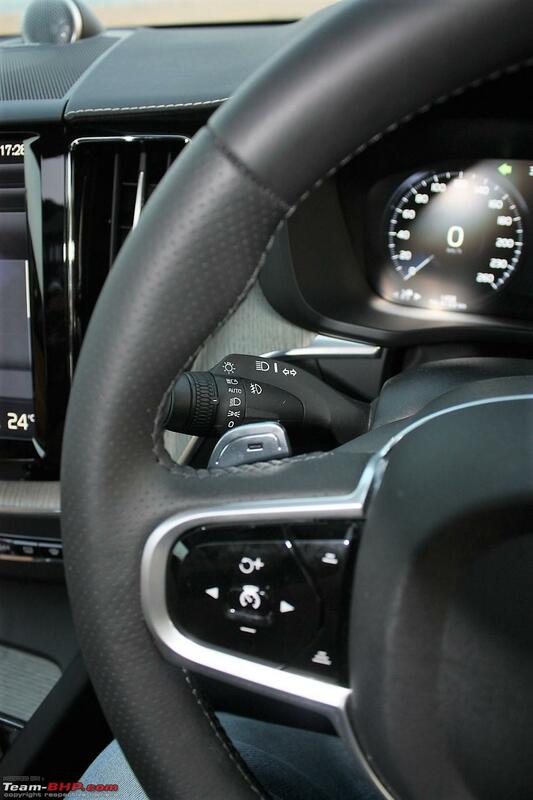 This system has more tolerance to inactivity from the steering wheel, unlike the pilot assist, which warns after 10 seconds of inactive steering inputs. Also the accelerator and brakes are under the driver's control unlike in cruise mode. If you are wondering how will the system react when you really want to make a lane change? Don’t worry; you just follow the safe practice of using indicators before a lane change, and the system will not interrupt with the shudder or auto steer - as simple as that. In fact, I felt this is a good way to teach folks to use indicators for lane changing. More on this in the video below. Now, from a driver’s perspective, it will take some time and needs some warming up to these semi autonomous interventions. Till then, it can be a little nerve wracking (especially if it is the first time, like it was for me ). But once you get used to them, it makes driving so effortless and relaxing, even on the busy East Coast Road. To be honest, I felt all these taught me better road discipline at the end of the day. The city safety system by Volvo is to avoid slow speed collisions or to reduce the impact in case of such events. Volvo has been working on these avoidance systems and the next iteration that helps avoid, rather reduce the chances and impact of collisions at higher speeds is termed as collision mitigation system. 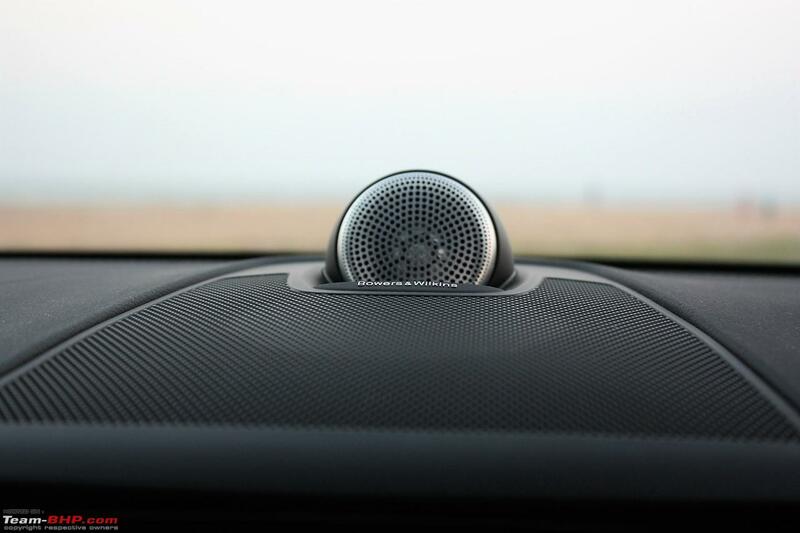 The on-board radar keeps a vigilant watch and prompts with steering inputs if there are any sudden obstacles that cut across the path of the vehicle, or if the system detects potential situations where a correction can help. These short videos explain the concept. This is apart from the safety braking system while reversing out of blind parking spots, which applies the brakes if the radar detects something approaching in the path. This is the auto parking feature and Volvo’s implementation of the same. 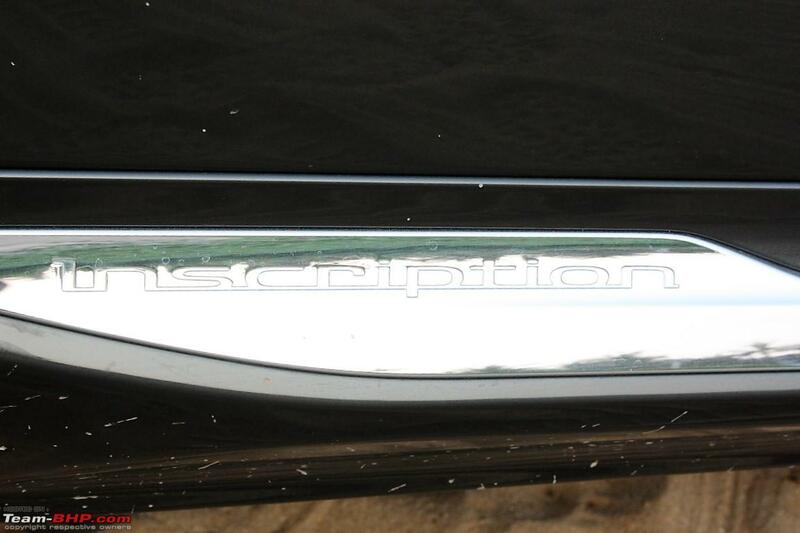 There is some interesting stuff that comes along with the vision package for the Collision mitigation from the rear. 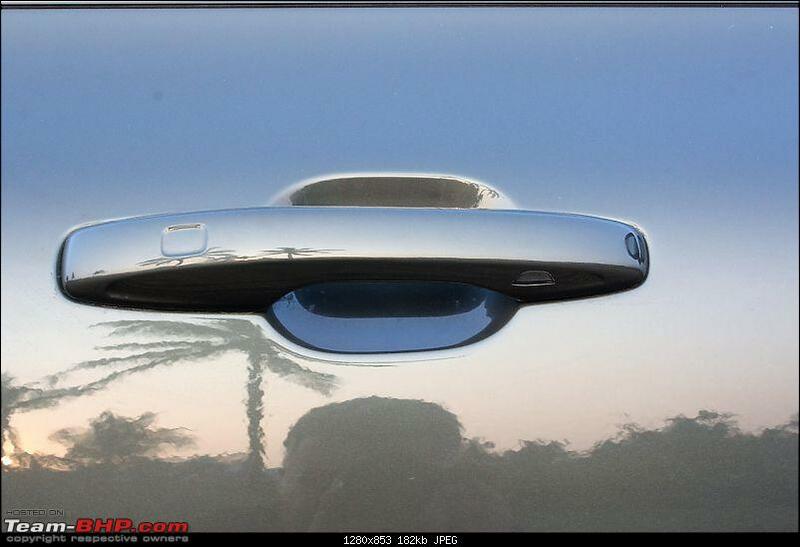 360-degree camera, which is a useful tool while parking in tight spaces and in crowded roads. 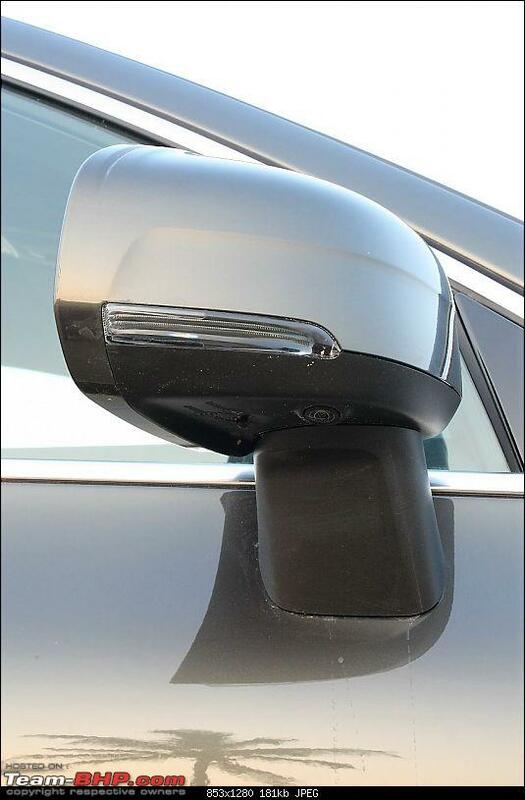 Blind spot warning light on the ORVMs, very helpful for making lane changes and detecting vehicles or objects that are usually hidden in the blind spots of the rear view mirror. 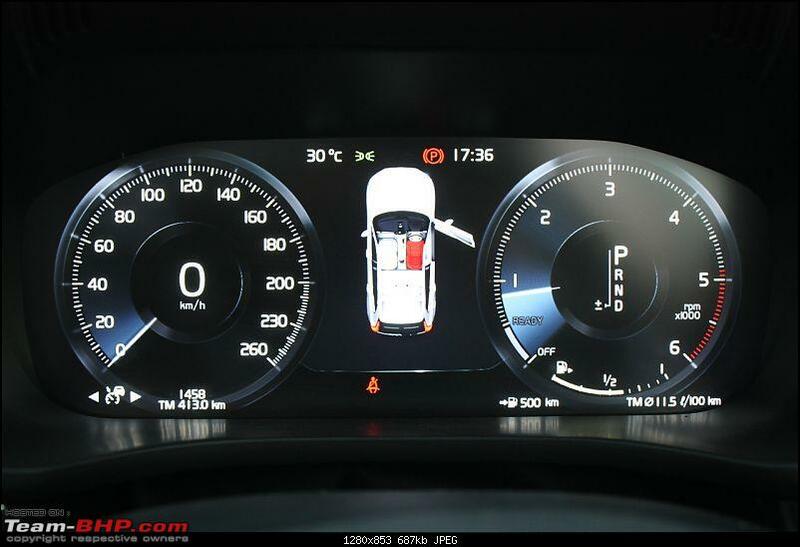 Head-up display that can show speed & warnings picked from the map and speed limits. Last edited by Aditya : 21st February 2018 at 10:48. The 1,969 cc, twin turbo diesel engine produces 232 BHP @ 4,000 rpm and a peak torque of 480 Nm @ 1,750 - 2,250 rpm. 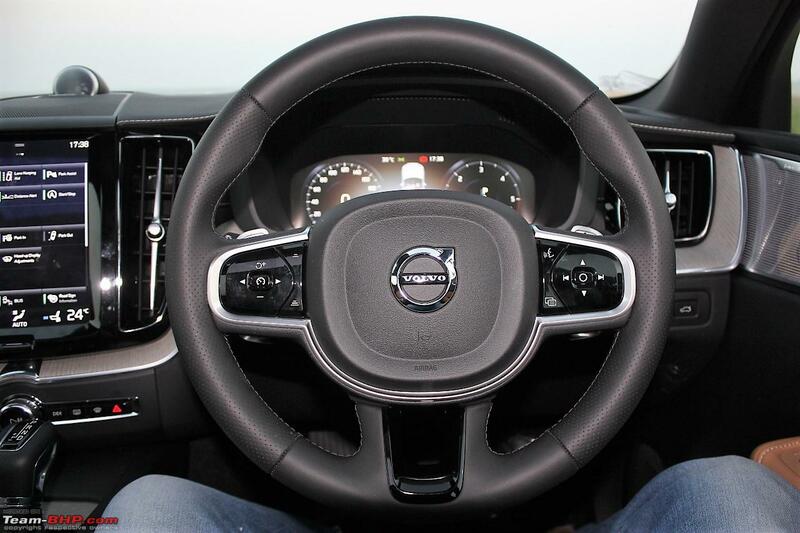 Volvo claims the top speed of the XC60 to be 230 km/h! Twist that start knob and the engine fires up without a fuss. With windows wound fully up, sound levels are under control. The noise as well as vibration damping is superb and Volvo has done a good job with the cabin, chassis and engine bay damping. Yet, there is no way one can hide that it is a diesel from the outside, especially when the engine is cold. Slot the gear into D mode - a gentle push on the accelerator deactivates the Auto parking brake and the vehicle starts to roll. There are 3 pre-set drive modes (comfort, dynamic & off-road) and another user customisable option where the user can set his preferences of steering, suspension and throttle. I started in comfort setting and found the steering to be light. Comfort mode does not mean a carpet-like ride at slow speeds though. There is some amount of firmness that filters in through the air suspension and even small undulations are felt, especially at the rear. 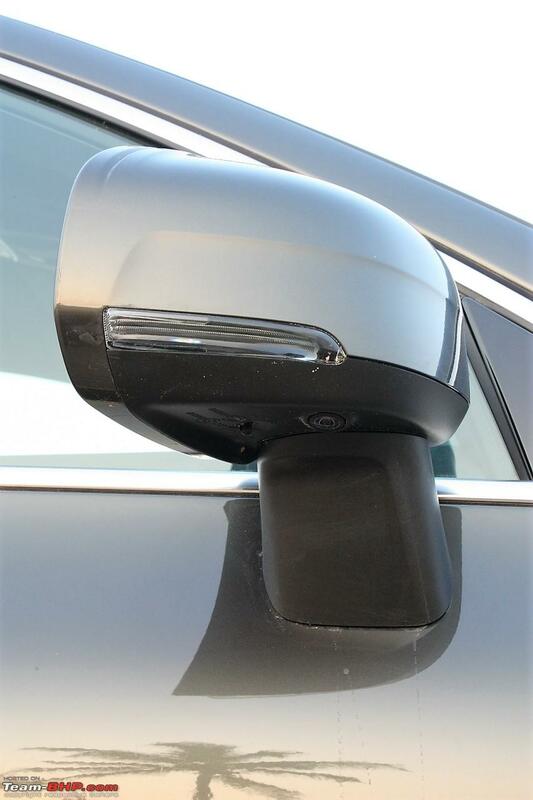 This is quite prominent at times, especially when you take those road humps inside apartment complexes where the rear would give you a bounce back in the XC60. Having said that, the XC60 is far better than say a Tiguan, but there is no hiding the fact this is more of an SUV than a sedan. Step onto the highway and it is time to give her some steam. The first thing you notice is the overall refinement of the car and if you have audio playing, you need to be really alert, since the overall ambiance cuts you completely off from the outside world. The acceleration is very linear in comfort setting and the turbo lag is hard to notice if you are accelerating gently. Only under sudden and heavy throttle (comfort mode), you are reminded that this is a 2-litre turbo diesel powering a 2 tonne car. I drove around for about 10 km in comfort setting and the first impression was this is a comfortable and relaxed cruiser for our highways. One can hit silly speeds without realizing it, thanks to the overall isolation the cabin provides. Still, you really don't get the performance of the 6-cylinder SUVs that the competition provides. Traffic was thin on this 4-lane stretch and I decided to play with the adaptive cruise control and lane assist. It took me some time to figure out how and by the time I figured it out, I had got into traffic and narrow town sections. I had the lane assist on under settings and at the next lane change, the steering wheel started vibrating like crazy! As if the tyre was moving on top of some reflective pegs, when there were none. Lesson learned! One needs to use the indicator to keep the system from reminding that you are moving out of the lane! The roads were opening up again and it was time for the dynamic mode. Immediate difference that you feel is the feedback from the engine; suddenly, the refined motor seems to have been replaced with an electric motor for power delivery. The dynamic mode with right throttle inputs brings good performance. 'Power Pulse' technology really works with this car. Check out the video to understand how the Power Pulse system (which uses compressed air) works. 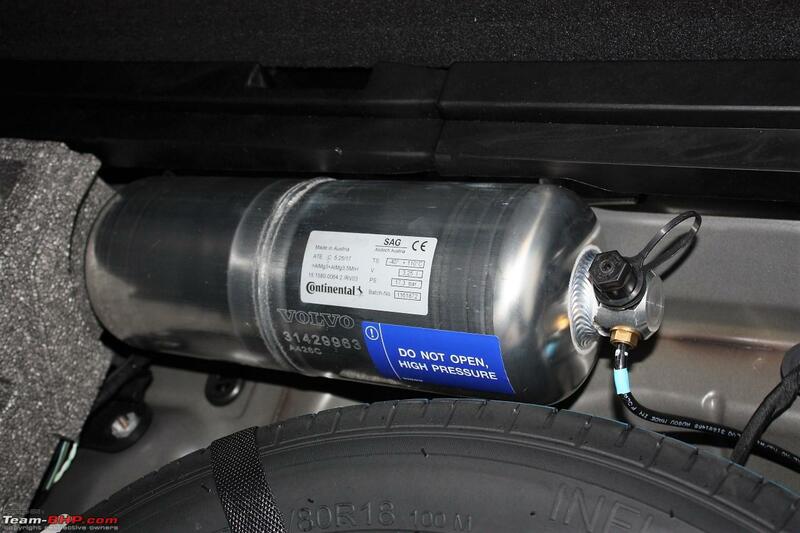 That pressurized can is a brilliant innovation for turbo diesels! It makes 2-lane driving such a hoot. Found a gap? Give a gentle push on the A pedal, and before you realize, you are overtaking that slow moving bus ahead like you are out on a national emergency. I confess, I did pull some fast ones on some cars, when I accelerated away as soon as I found small gaps in traffic leaving them huffing and puffing . This car can bring a silly grin on your face; it is only those warning signs that keep flashing on the head-up display that would keep you sane. 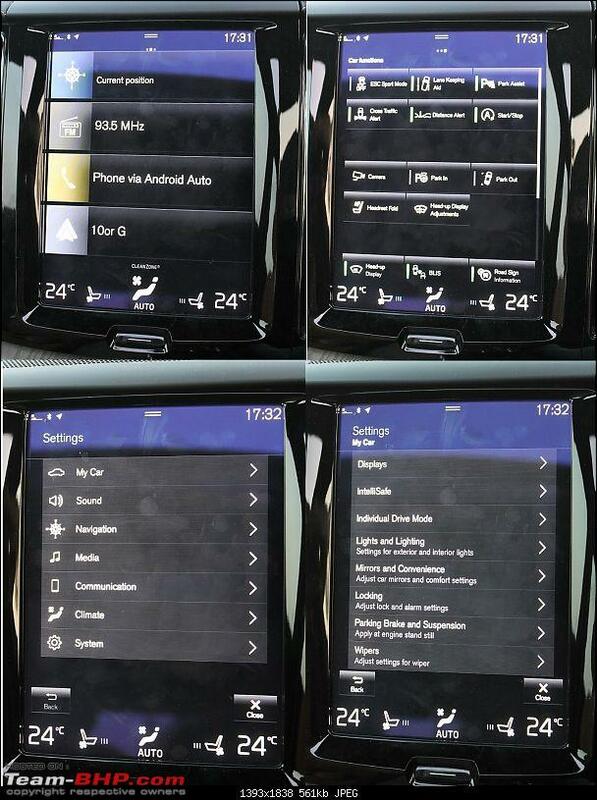 The HUD picks up information like school or towns, speed limits (as per the navigation) etc. The speed sensitive steering marginally tightens up, I felt it became more direct than the actual resistance and would have preferred the steering to load up too. At the end of the day, I would say this is a typical electrical steering, nothing to rave or complain about. Take a fast sweeping turn and the pilot assist will give you lessons on keeping it tidy and tight; works brilliantly even on two lane roads with edge markings. At the end of an hour's drive, I was using lane indication without being prompted by the car and sticking to the centre of the lane. This Volvo kind of taught me a better driving sense for sure. On a clean stretch, I even loosened the grip and the car brilliantly took the curve without any steering inputs from me using the lane-keeping aid! Yep, the system does work in India too. 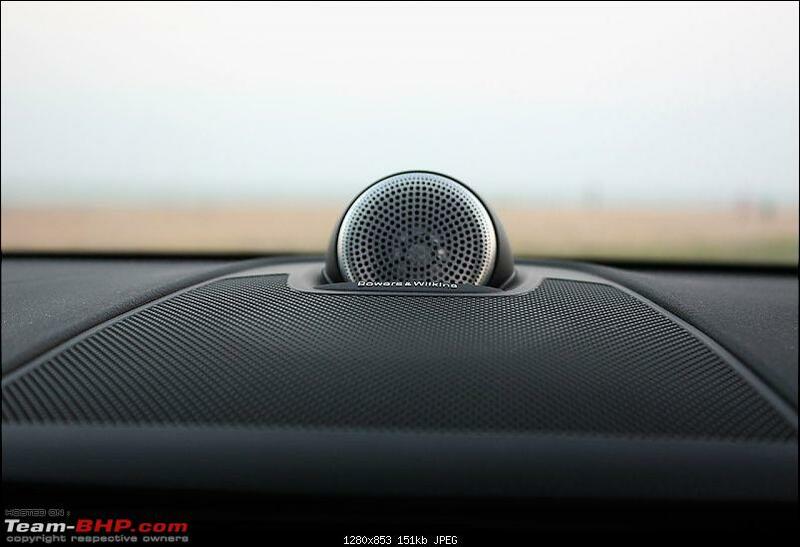 I was sceptical for the radar based hype and how it would work in India, but this drive proved me wrong. It does work well on our Indian roads and will go a long way in improving the safety aspect of our roads. 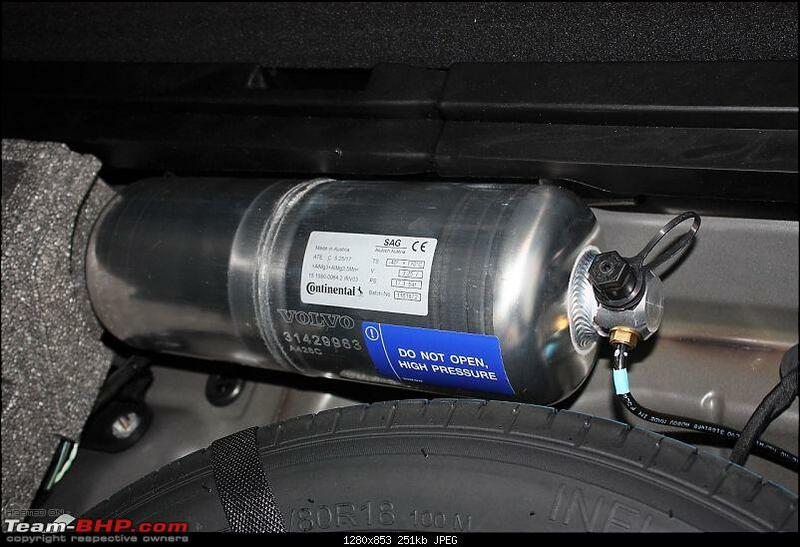 I sure hope more and more manufacturers take note and start launching these in their cars. Remember, end of the day, while these systems debut in the high-end cars, they will eventually filter down to the mass market (Airbags & ABS are the best example of that). 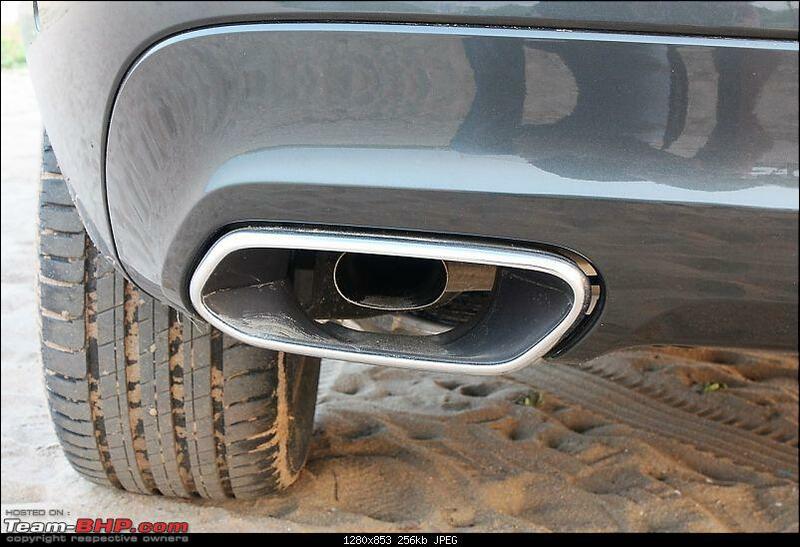 For the time being, Volvo has got all the required clearances for these systems to be used in India. 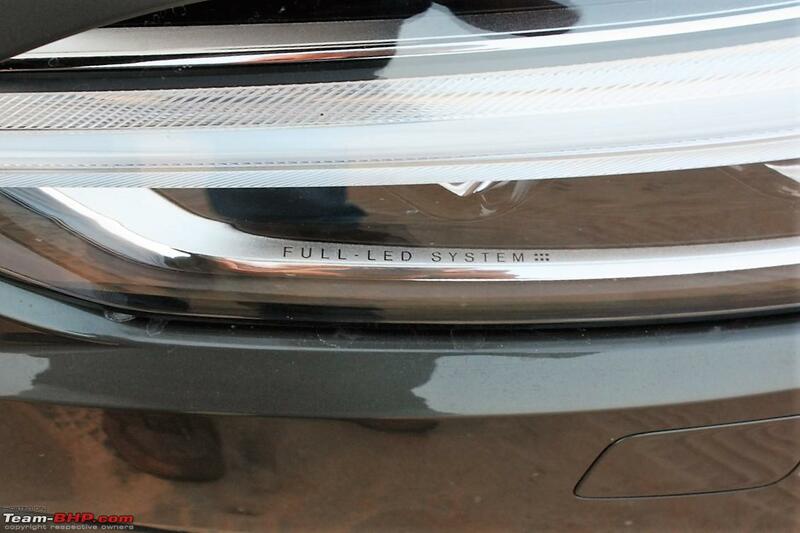 I understand that more luxury car makers are also actively working on bringing these systems to India. 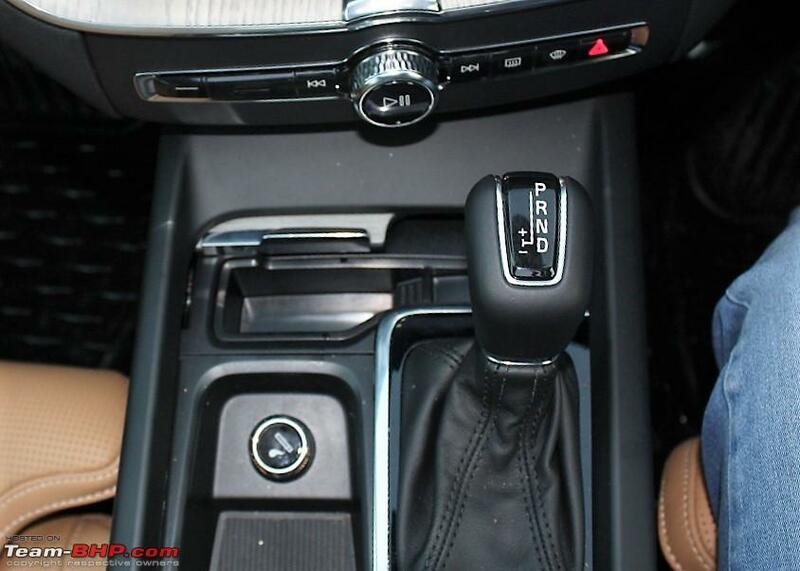 Aisin’s 8-speed gearbox is fast and takes very little effort from the throttle to kick down. 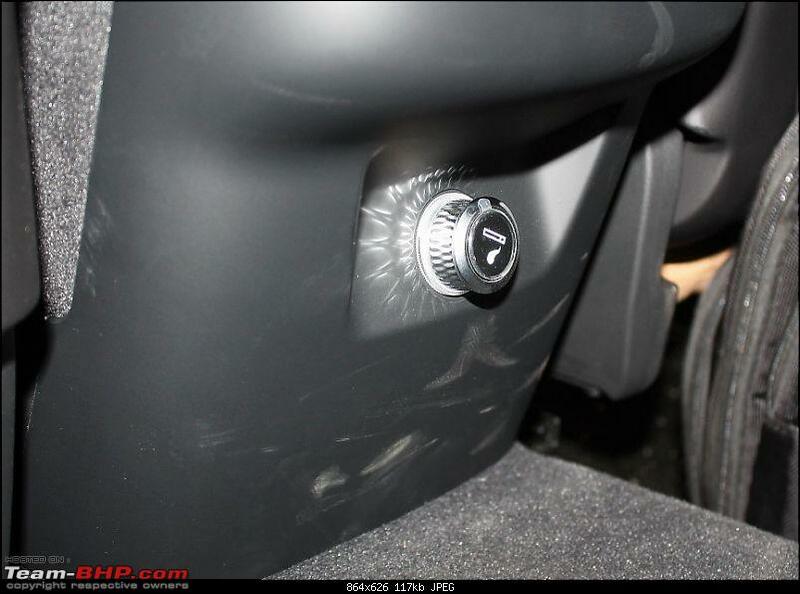 While the comfort mode needed a heavier foot, dynamic mode only requires a gentle push from the throttle to start the downshift. I tried mashing down the accelerator and happily the cogs went down by 2 or 3 for those urgent overtaking manoeuvres. It works very well for the intended purpose, as most of these modern auto boxes pretty much tick off on the entire performance and refinement checklist. Comfort mode is what passengers would like; however, there is the low speed firmness I mentioned earlier and at speeds there is a little bounce at the back. The stretch I drove had a very good surface and speeds were mostly south of 100 km/h, making the evaluation a bit hard. 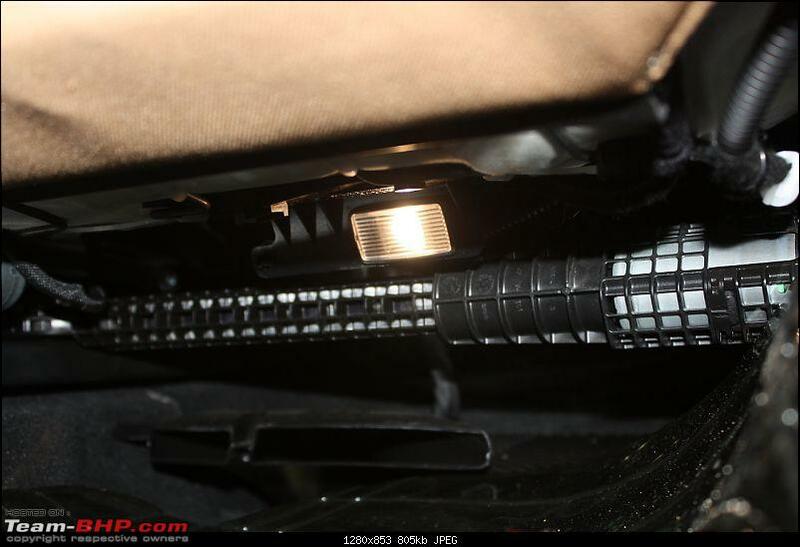 On the other hand, the dynamic mode not only lowers the ride height, it stiffens the air suspension as well. Handling was crisper at the turns and the ride also felt marginally harder. Again, the roads and the drive really did not offer too much scope to test these aspects at greater limits, but I can confidently say that dynamic is the mode to be in from a driver's perspective. Now, apart from this, there is an off-road mode that raises the suspension to the highest level. 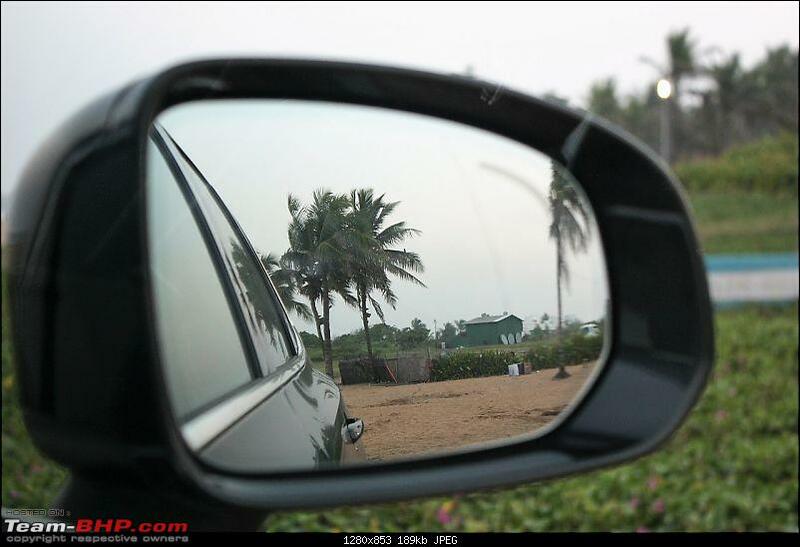 I had an opportunity to try this mode over a very short stretch, when I took the car to the beach. It has a speed limit, so the moment you climb over 45 km/h, a warning sign will come and the mode will eventually get deactivated, if you try to push further. Acceleration felt rather muted and the shifts rather long in the off-road mode (compared even to comfort mode). 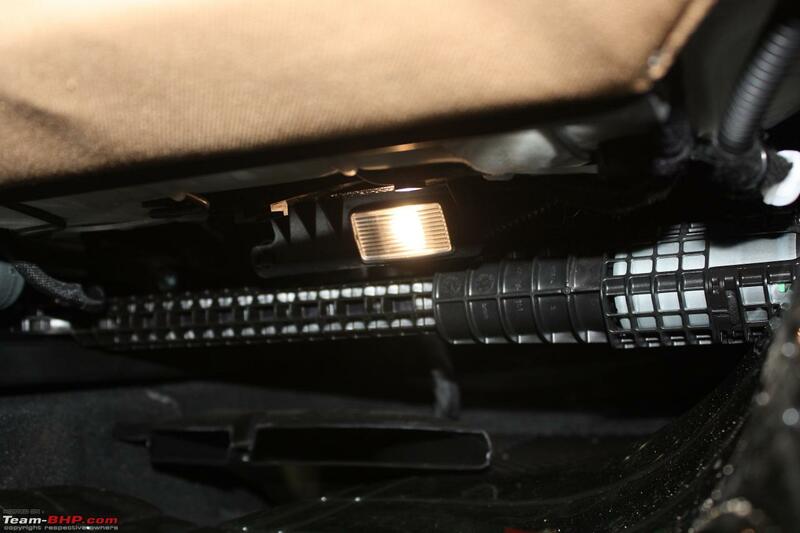 I understand this is to aid better traction for the loose surface that off-road scenarios bring in. Being a Volvo that is known for safety, there is no point in writing more about the brakes - they are just fantastic! With the right amount of modulation / feedback, they work consistently without a hint of doubt in any situation. These brakes even have enough intelligence built into them - it will pre-load the brake system for you when it senses a possible collision situation ahead. I tried replicating some hard stops and the car was brilliant at handling them. Last edited by Aditya : 21st February 2018 at 10:49. 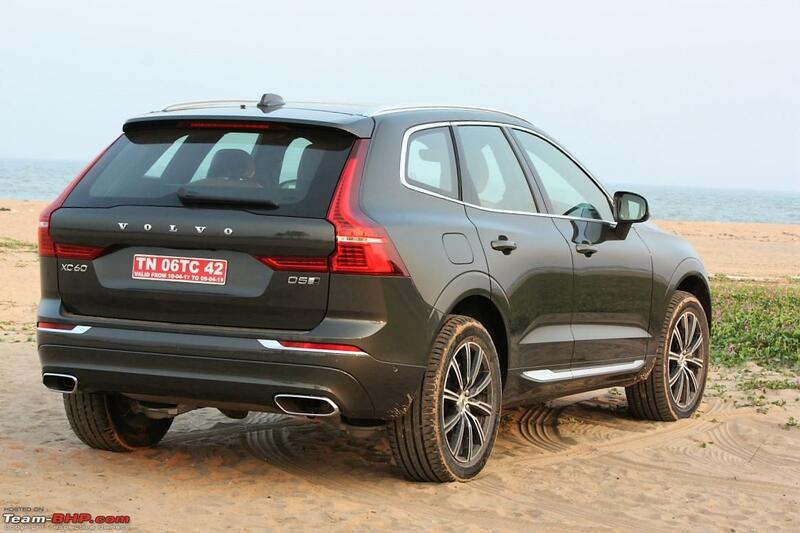 Disclaimer: Volvo invited Team-BHP for the XC60 test-drive. They covered all the travel expenses for this driving event. Last edited by Jaggu : 26th November 2018 at 16:42. 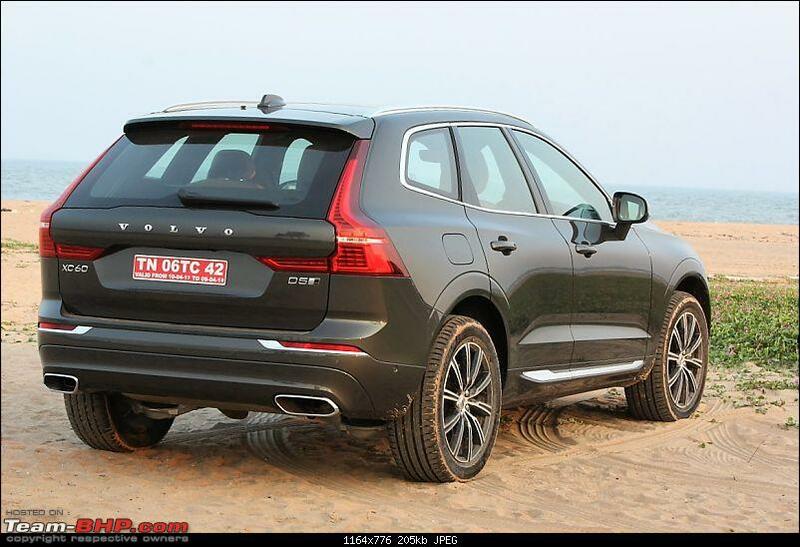 I drove S90 first and then XC60. Being a sedan person, I find S90 to be a great looking car and I loved the S90 in the showroom but it was so so to drive. 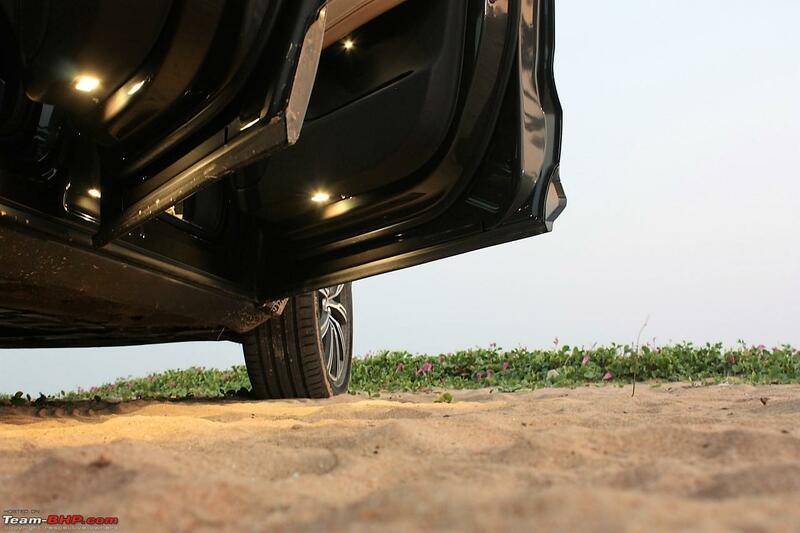 The more powerful engine and full air suspension of XC60 immediately removed S90 from the shortlist. Rest of my post is about XC60. The power delivery in XC60 is very good. It was a bit unusual experience because it drove like a petrol but with diesel noise. Significantly improves driving in city. Transmission did it's job, nothing to fault but not sporty either. You will not be disappointed by the power on tap. I am told the demo car has some performance (polestar?) update. Steering wheel is a bit smaller in size and extremely light. This can be a deal breaker for some. To be honest, this has to be judged on a highway drive but it is safe to guess what approach Volvo has taken as far as steering feel is concerned. If you prefer a lighter steering, then you can stop reading further and buy this car. 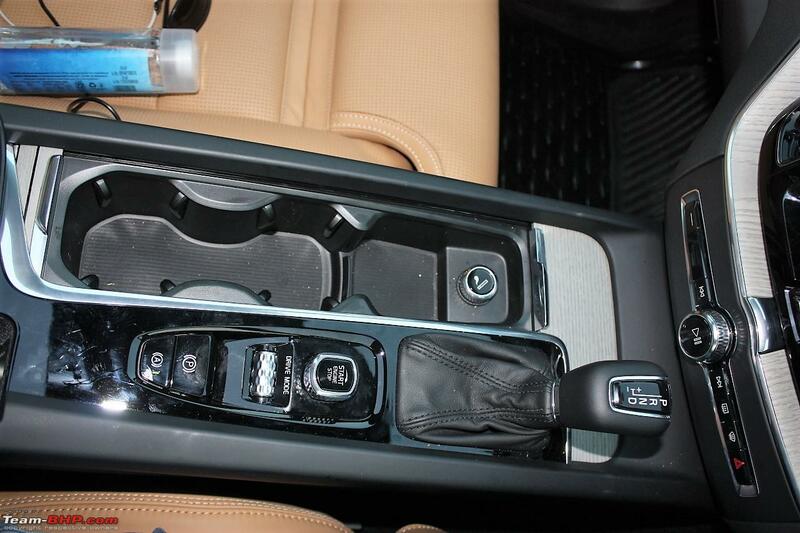 NVH, ride comfort, A/C everything is top notch. I had few sections of peak hour traffic and it did a great job of shutting out all the outside chaos only to be spoilt by the auto start stop (which I turned off using the touch console). Kit: I am trying to think of some modern feature it doesn't have You will not find another car that has half of what this car offers. It even has the most advanced feature of 2017: wheelwell with a space saver. Touch screen console is great looking but it can be a pain depending on your personal preference. If you employ a driver or you are a bit clumsy with technology, this panel can be a real challange to use. 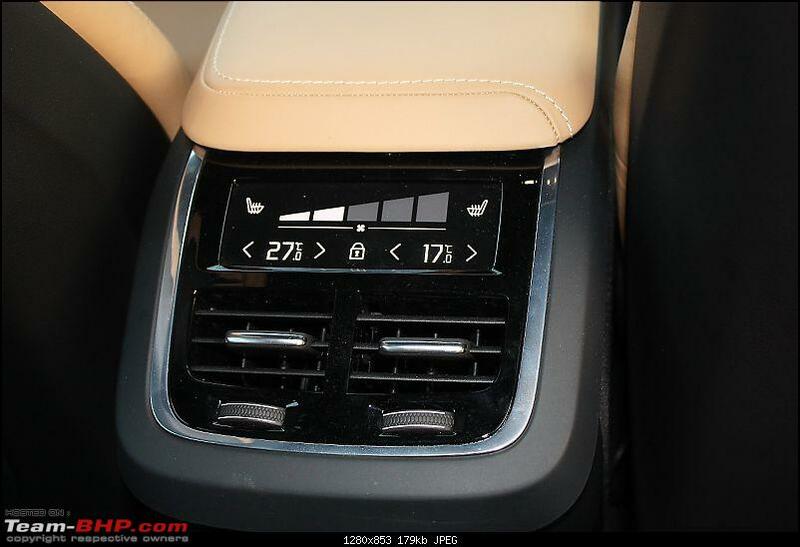 From a car with highest number of buttons, it has become the car with the lowest number of buttons in Indian market. I get the idea of declutter but not at the expense of usability. Instrument cluster screen is less dramatic and resolution seems to be a bit lower. Rear seats are basic. 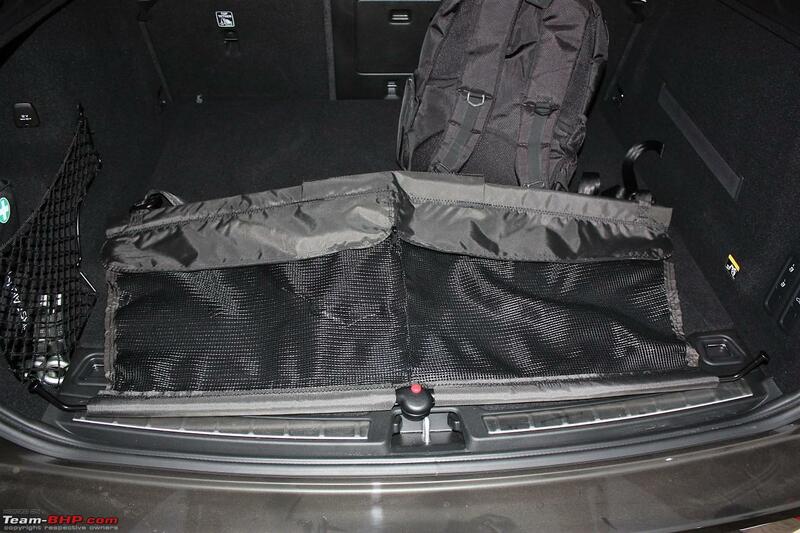 No side airbags (not expected in this segment? ), no recline, no remote, etc. The main reason why I visited the dealership was to check out the seats. 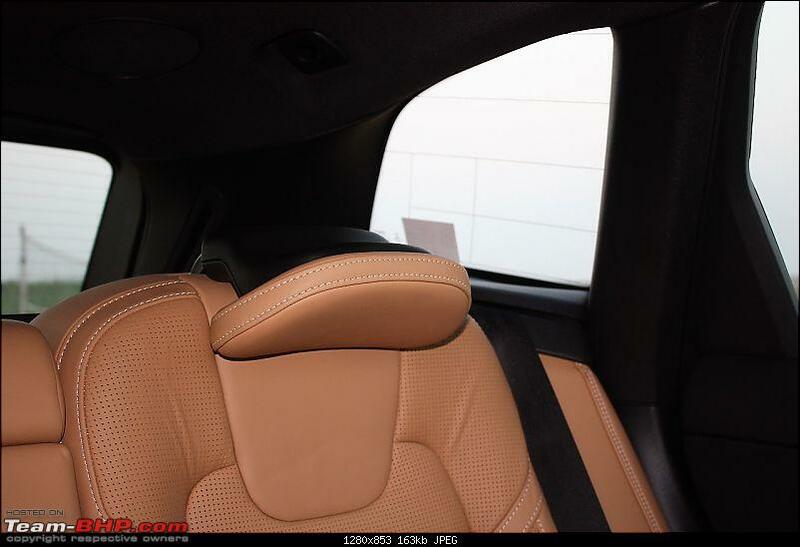 The spec puts even an S class (Indian) to shame: Nappa leather, ventilated, massaging, adjustable side bolster, lumbar, thigh extender, etc. But they forgot the most basic thing that makes a seat comfortable: cushion! 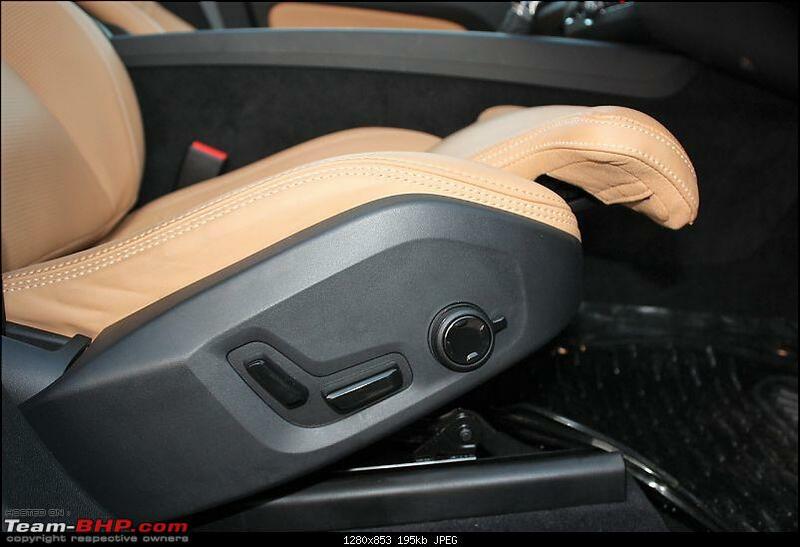 The seats are firm and lack all around comfort even after adjustments. 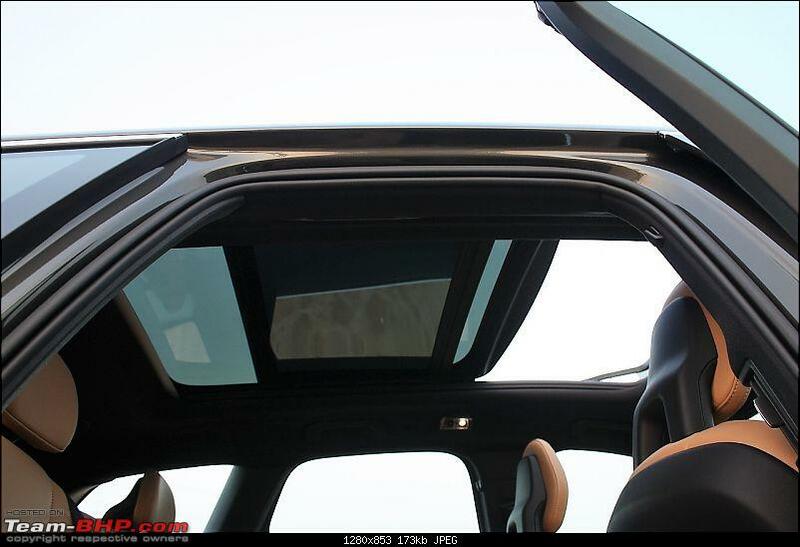 They have black plastic on the back and at the bottom, something that is associated with entry level luxury. Don't get me wrong, they are still good and ventilation alone will make them the segment best. 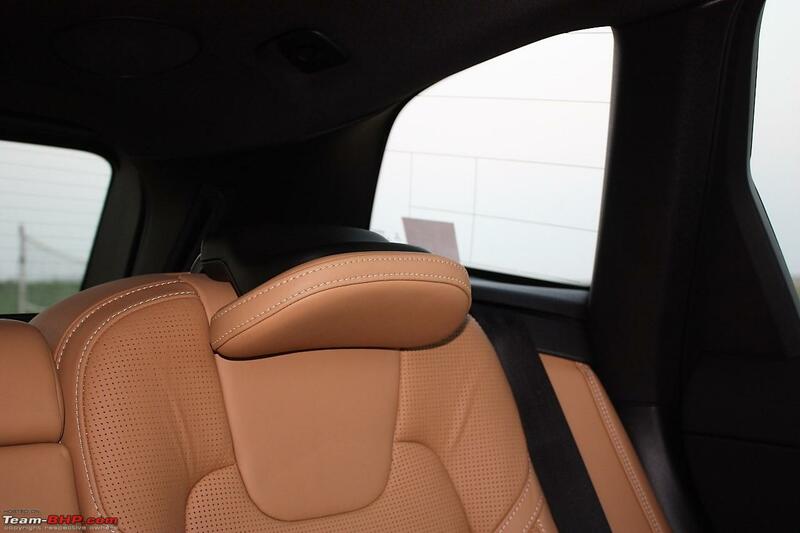 I found the humble V40 R-Design seats very comfortable with good leather + good cushion + good all around support. Overall impression: if you already have a soft corner for Volvo or owned previous gen Volvos, you will be amazed by how good this version is. 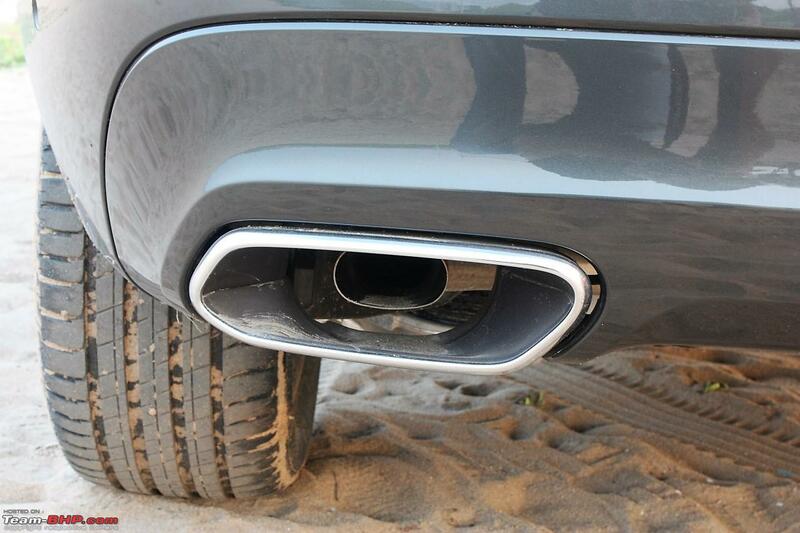 You no longer have to explain why you bought a Volvo instead of the big Germans. In fact, there will be a good amount of envy/admiration. For others, you have to get past the over assisted steering and mentally prepare yourself for the driverless future. Last edited by Aditya : 21st February 2018 at 10:51. Test drove the XC60 during the weekend. The drive was mostly in city traffic with some part of it in highway like roads. Drove around 40 KMs and here are my thoughts on the car. 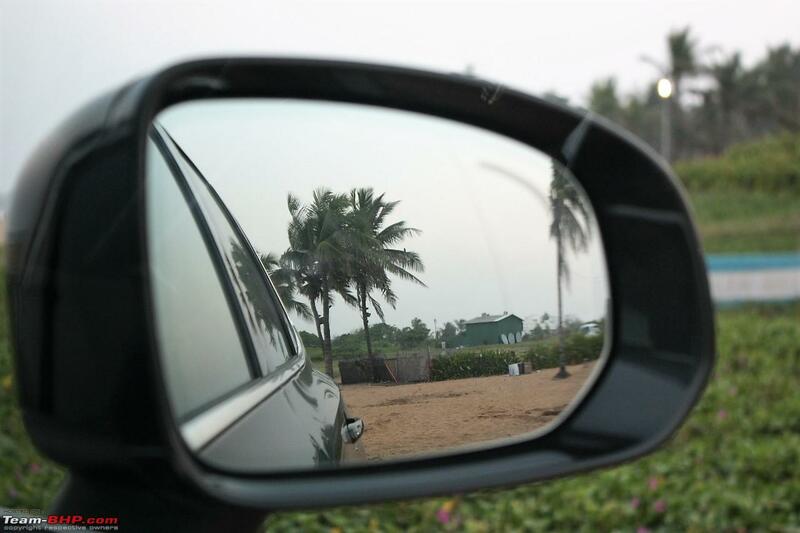 1) Drove in Comfort for about 15 - 20 kilometers and the car doesn't feel enthusiastic. 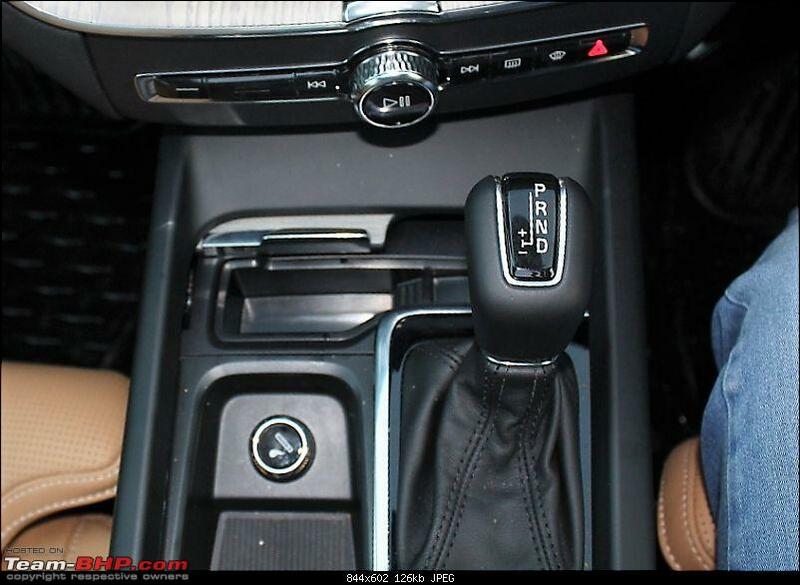 The steering is light, lacks feel and for someone who is used to driving an Octavia, it didn't feel confidence inspiring. The power delivery was sluggish, with the car preferring a light application of the accelerator. 2) Switch to dynamic mode and the car felt a heck of lot more eager. The turbo lag which was quite evident in Comfort mode was hardly present in this mode. The steering had more feel and it got better with speed. I did a few quick overtaking maneuvers from a relative slow speed of around 40 - 45 kmph and each time, the gearbox made the right decision (dropping a gear or staying in gear) and delivered instantaneous power, making the overtake effortless. If I were to buy this car, I now I will perhaps always be in Dynamic mode cause that where the car comes alive. 3) The Bowers & Wilkins system is something else, especially the Gothenburg Concert hall mode. 4) The cabin is quiet with hardly any road noise. 5) The ride quality in comfort is smooth and that along with the quiet cabin makes for a very relaxing experience. 6) The front seats are very comfortable. Didn't quite feel the effect of the ventilated seats but I am not sure if they were turned on properly. 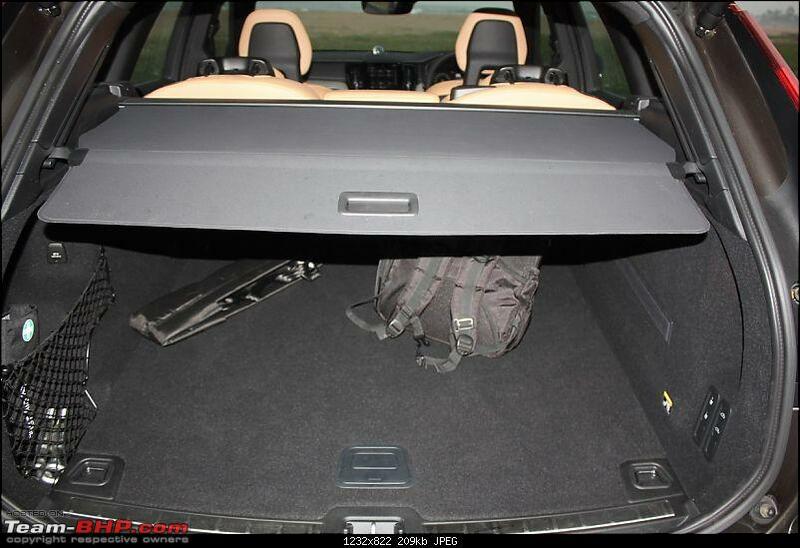 The rear seats could have done with more under thigh support but are otherwise comfortable. Lots of leg room at the back. 7) The air conditioning was much better than what I am used to in my Octavia but my wife felt the AC at the rear could have been better. Didn't feel the same when I sat at the back but then perhaps by then the car was already cool enough. 8) Hated the automatic stop/start feature. Just find it very annoying. 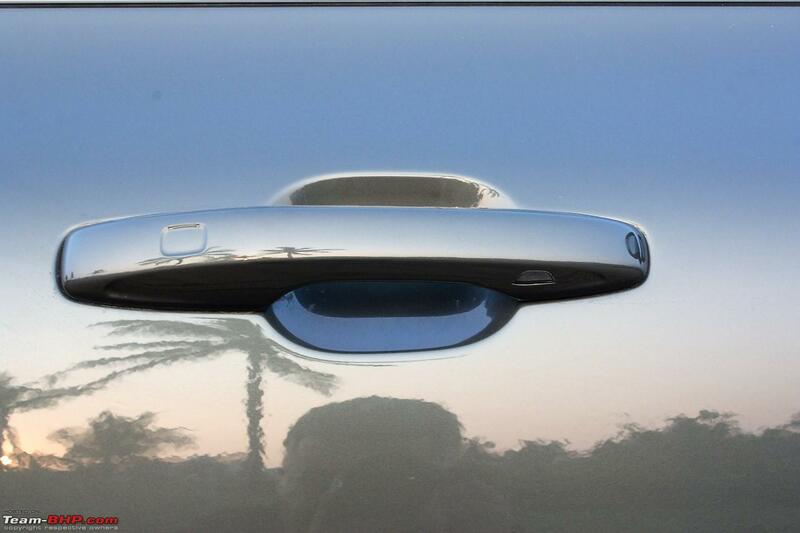 9) The blind spot detection feature was pretty much working overtime in the city. 10) The lane assist was another feature that was constantly getting engaged each time I switched lanes to overtake a vehicle, with a slight shudder of the steering. Would probably turn that off in the city. 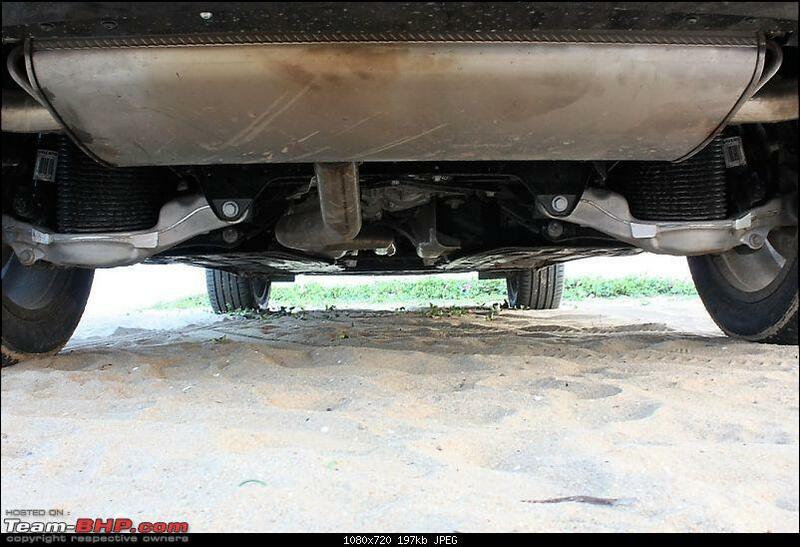 11) One of the complaints my wife had was that air suspension (along with the tall stance) of the car gave it a boat like ride quality on some sections of the road, which is a big problem for her given she suffers from motion sickness. Overall, would have loved the car to be a bit more sporty but that's just me being greedy. As it is, the car is absolutely wonderful, and given that it's mostly going to be driven in the city by most buyers, it's probably the perfect package, loaded with features, plush interiors, great looks, has a presence and turns heads. Last edited by Aditya : 21st February 2018 at 10:52. I've been following this thread from the beginning as I've been planning to buy a new car. On that note, I've done multiple test drives of the XC60 and was a 100% convinced by it. But something has confused me recently. 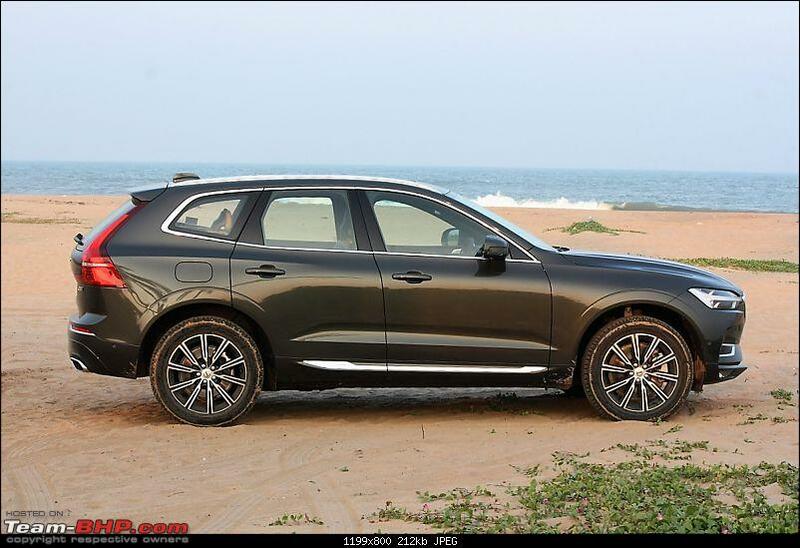 The dealers are giving 8-10 Lacs off the S90. So I decided to take a drive of the S90 as well. Below is my detailed understanding of the differences between the 2 cars. - Comfort - I drove both cars through some very rough and patchy roads. I was surprised to realise that the S90, even with its non airomatic front suspension is more comfortable than the XC60. 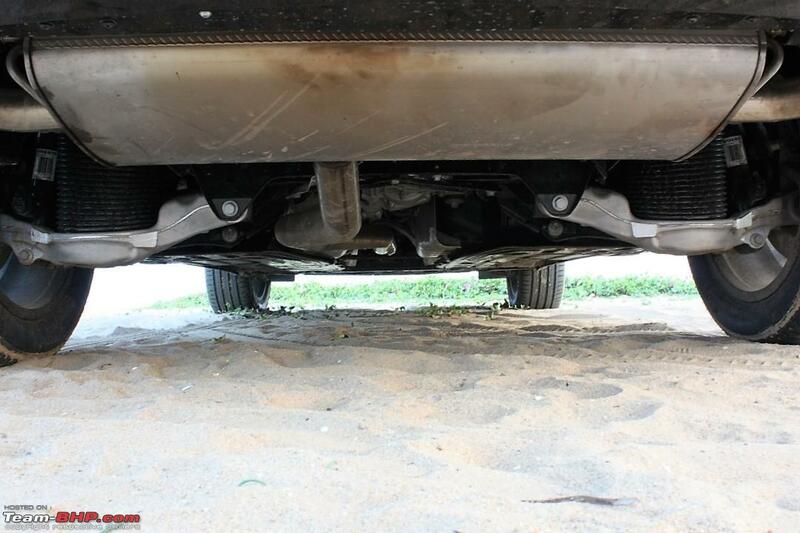 The suspension is far softer and handles potholes with a lot of grace. 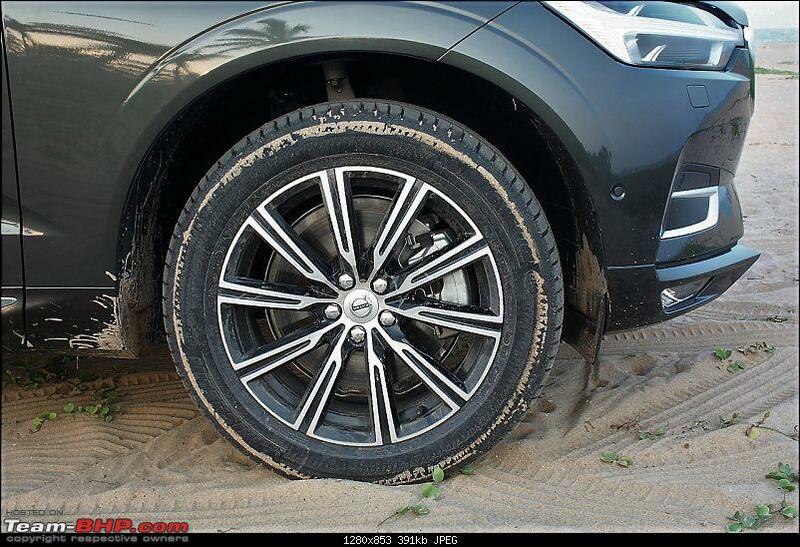 The XC60 was not uncomfortable by any means but you feel the potholes a little more in it. 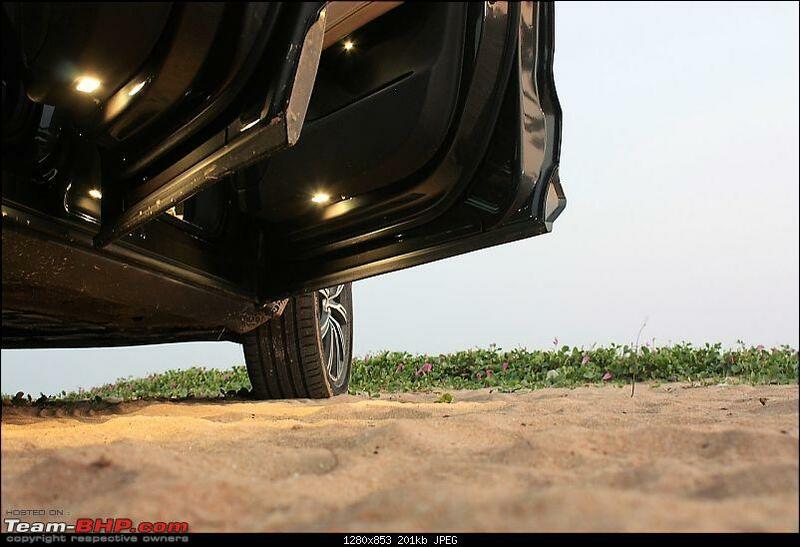 Consider the fact that the S90 has a lower tire profile still it felt more comfortable. 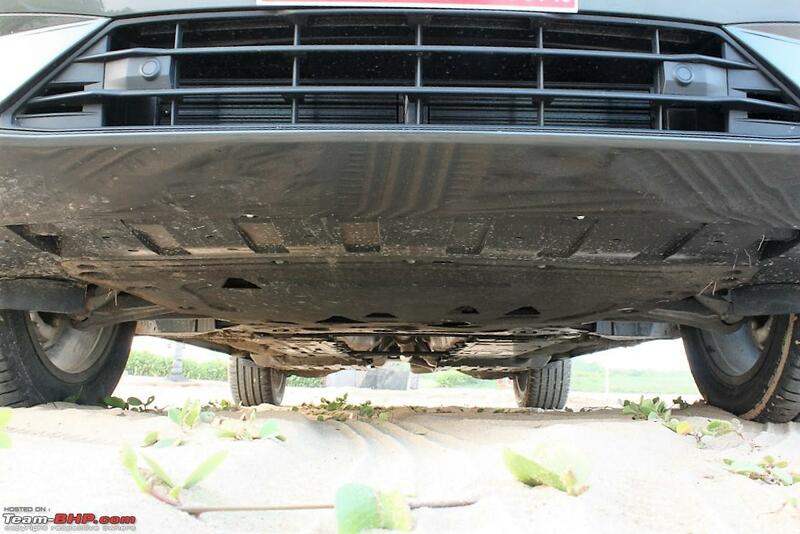 Another bit of surprise was the S90's ground clearance. Because of the car's proportions one feels that the GC is low, but it took a lot of bumps and potholes with grace which even my 3 series struggles with inspite of better GC on paper. - Back Seat - In terms of space, the S90 has far more back seat space than the XC60 but the seat in S90 is almost like a park bench. The bottom of the seat is too short and too hard. I think in the whole effort to integrate a child bench within the back seat has resulted in a very weird sitting position in the S90 back seat. It is not comfortable. 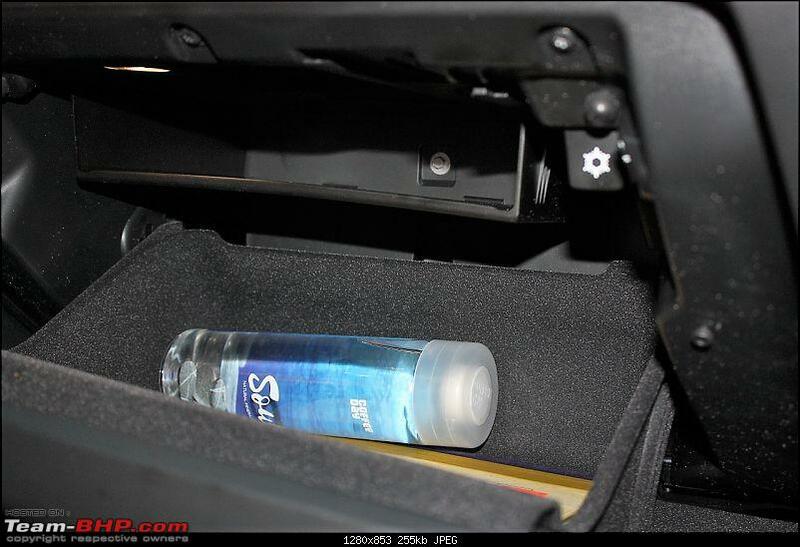 On the contrary, the XC60's back seat is very very comfortable. It has perfect under thigh support and is angled quite nicely. 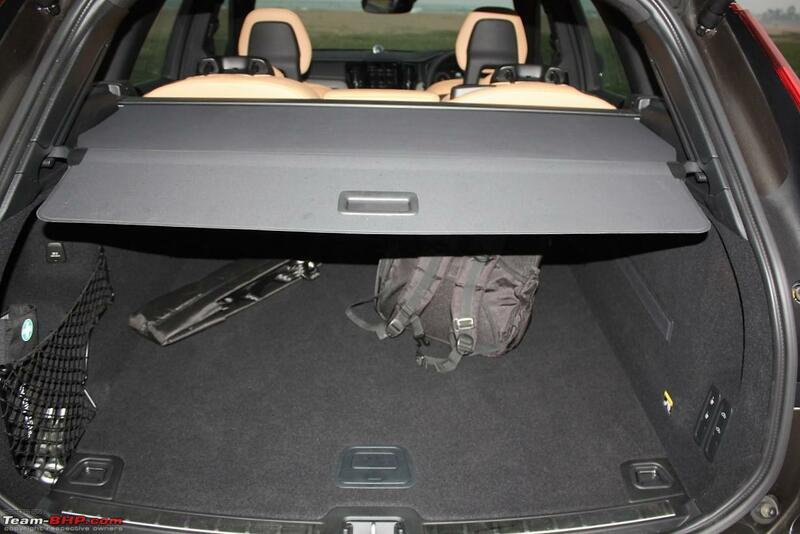 The space is a little less than S90 but by no means uncomfortable. 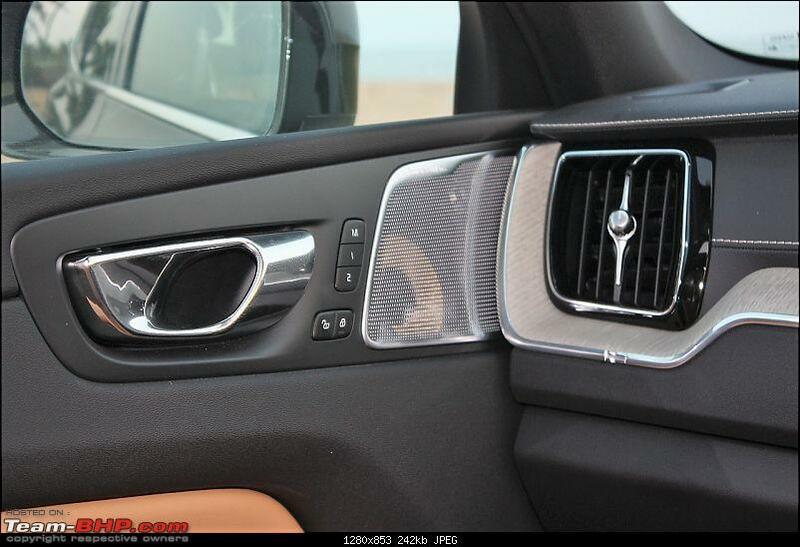 - Luxury - The S90 is considerably more luxurious on the inside. The leather stitching on the dashboard goes all the way till the bottom. 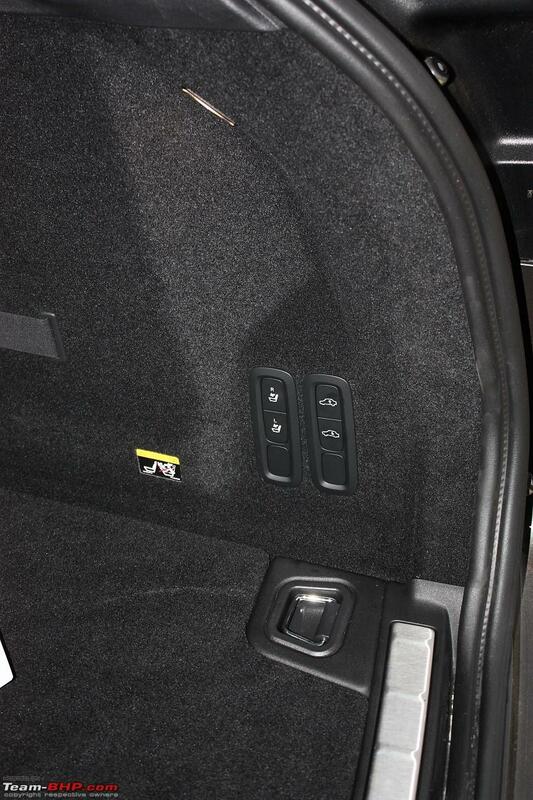 The wood inserts continue in the door panels as well as dashboard. 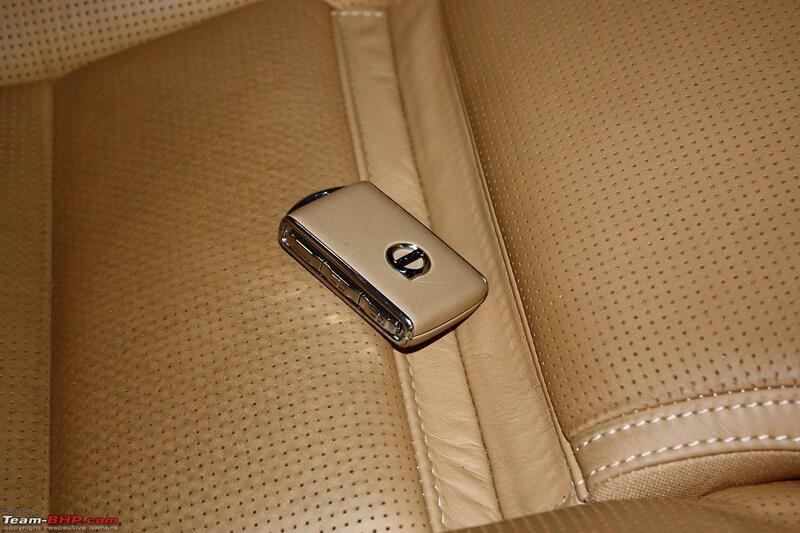 The steering is a dual tone leather wrap, but the steering in S90 is not Heated. In the XC60 it is ! 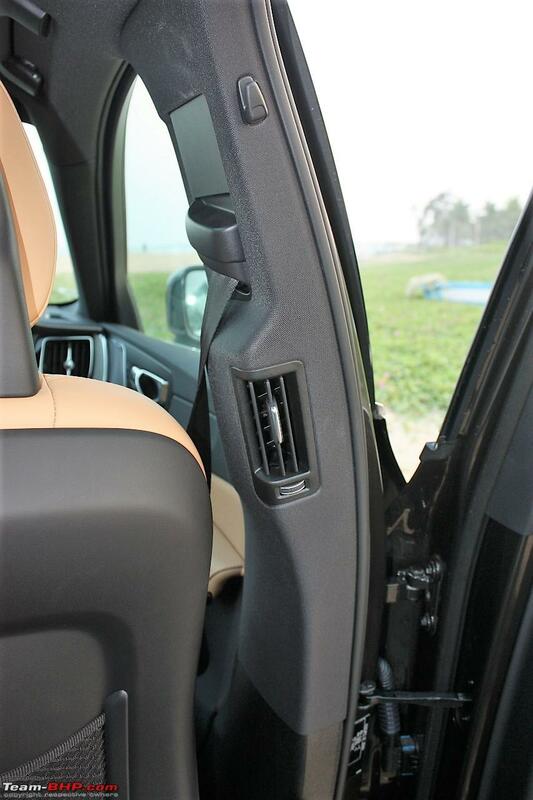 The back windows have curtains in the S90 but this feature is missing in XC60. 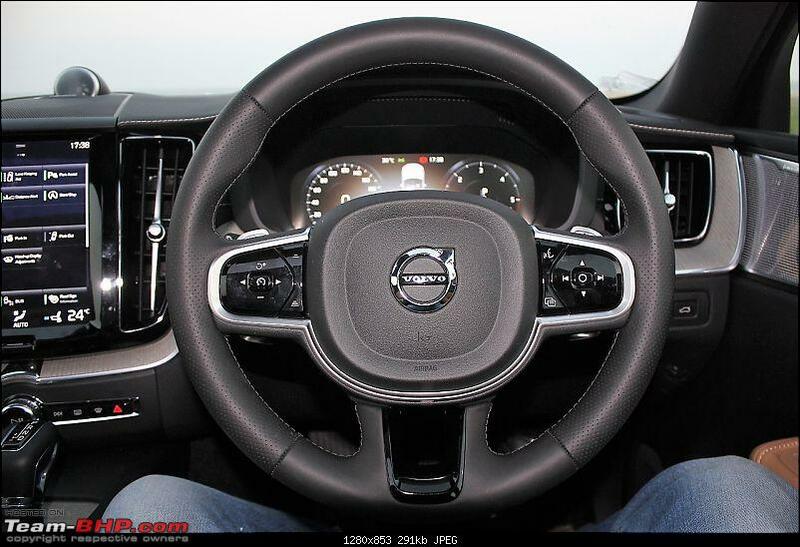 The entire dashboard of S90 is leather stitched whereas the XC60 gets a black plastic bottom part in the dash. Same goes for Doors. 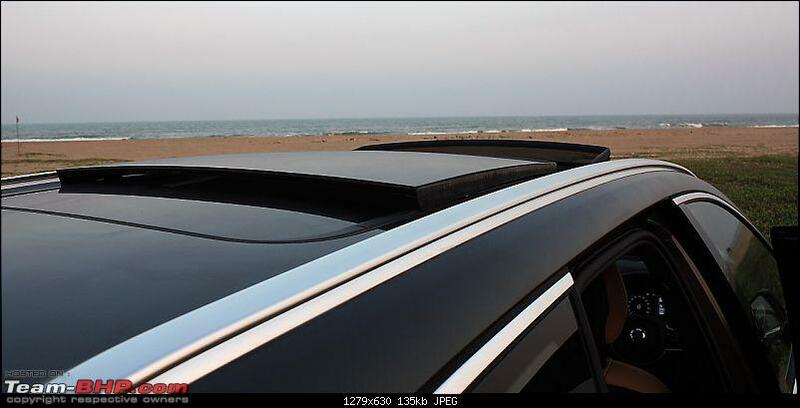 The S90 gets a normal sunroof whereas the XC60 gets a panoramic one. 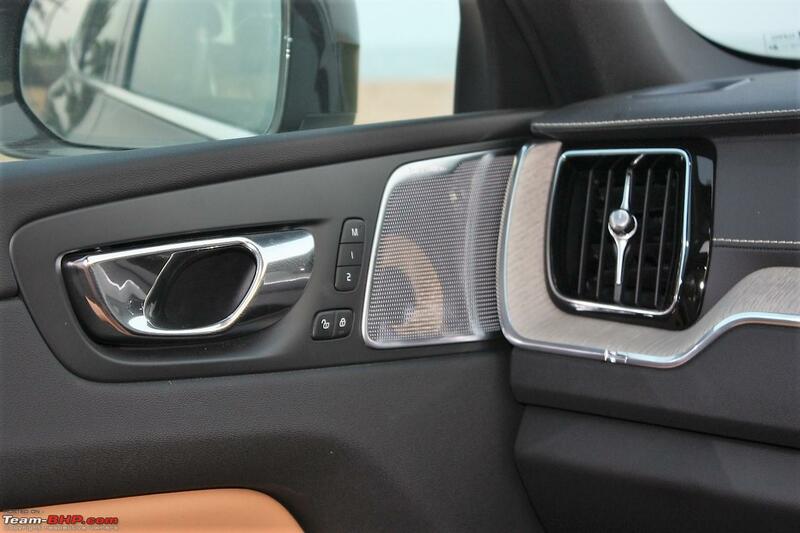 Audio - The Audio System in the S90 is 19 speakers whereas the XC60 has a 15 speaker system. Although it doesn't seem to be much of a difference on paper, but if you're an audiophile, there's absolutely no comparison between the 2. The 19 Speaker system in S90 is the best I've ever heard. The Depth of the bass is just unparalleled. 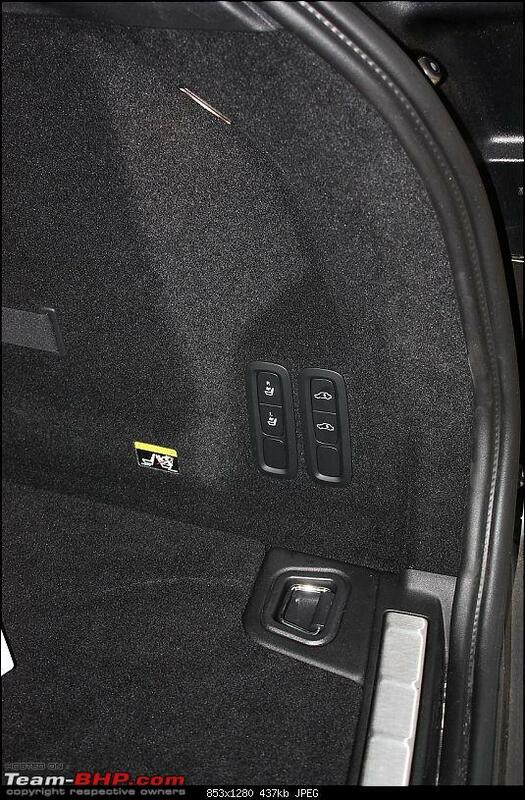 The XC60 system has very good sound clarity but it doesn't deliver the same depth and bass as the S90's system. 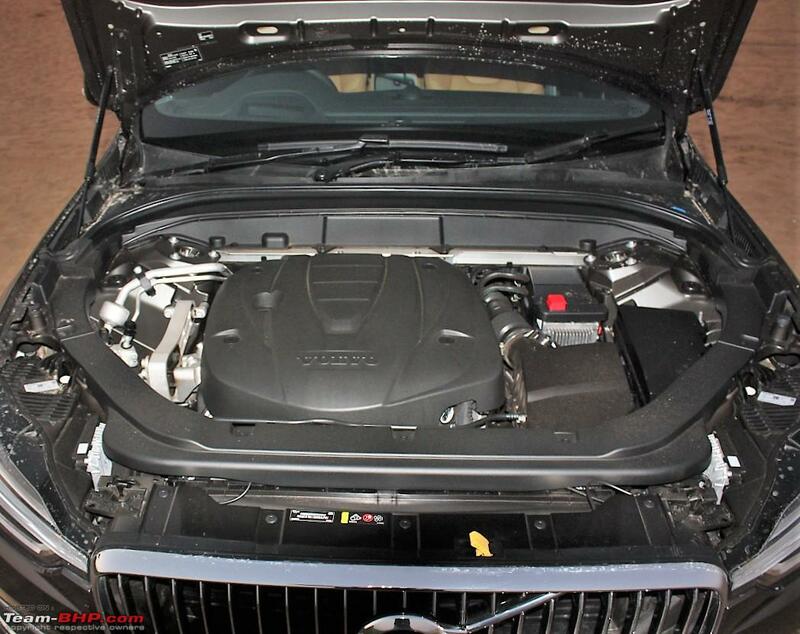 Engine - The S90 gets a 190bhp motor whereas the XC60 gets 235 BHP. The S90 is more relaxed and poised in city driving, with lesser zip in the engine than XC60, there's a lesser amount of jerks within traffic. 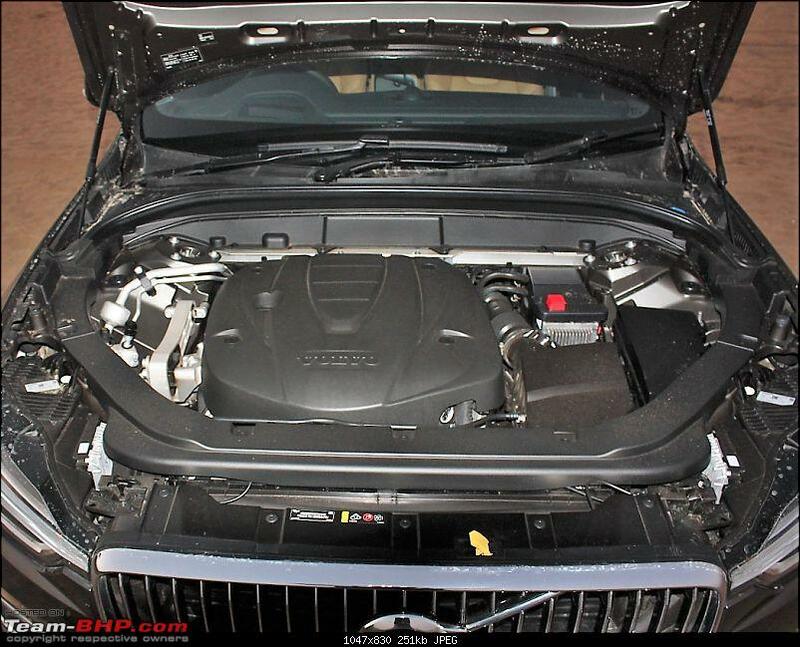 The XC60 has a lot of Zip in the engine, hence a little more jerky. That Said, the S90 starts struggling post 140 km/h on the highway. 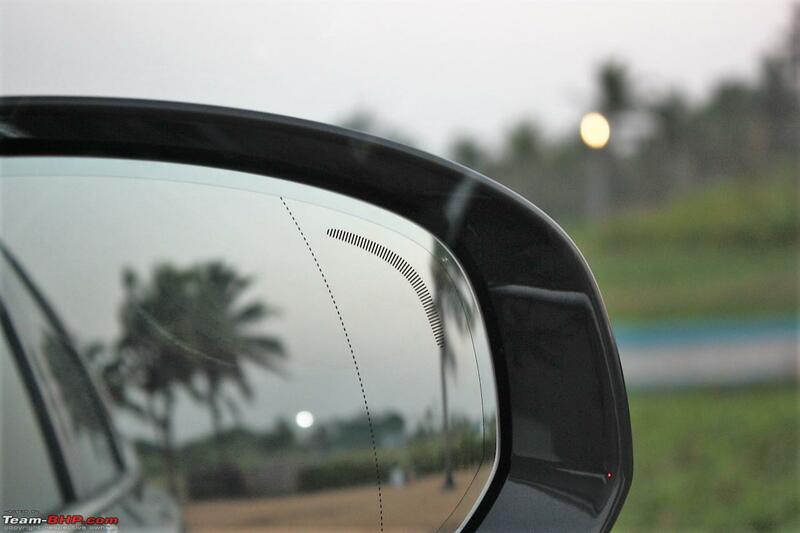 The XC60 went up to 180 km/h with ease, post which it started struggling a bit. 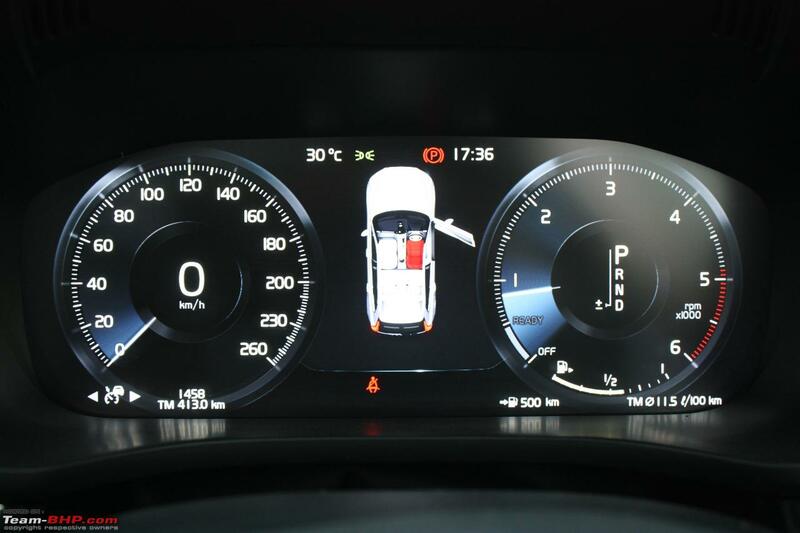 But in the Xc60, one thing that happened again and again to me was, whenever I looked at the speedo, I was actually 30-40Km/h faster than I imagined. At 1 point I was at 140 km/h where I swear I thought I must be at 90. The car is just so quiet and effortless. Mind you, for comparison, my 320d feels a lot more powerful than both of the above on the highway. 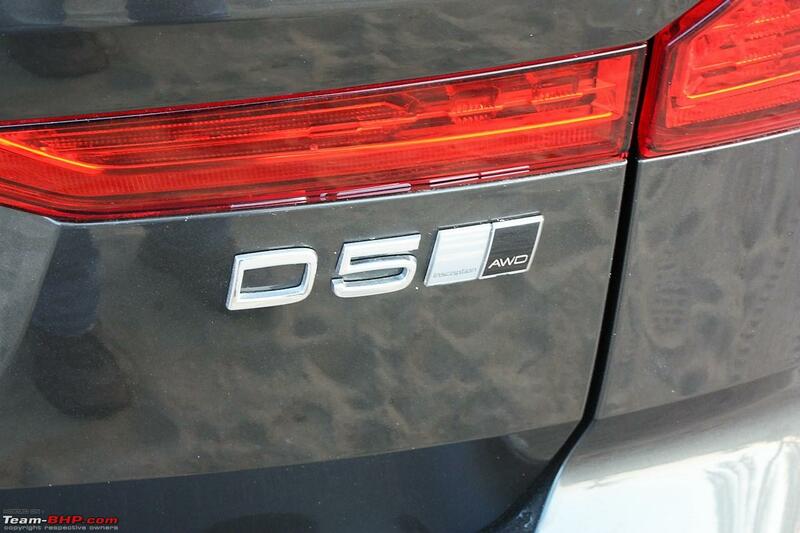 The amount of control and power back up it has even at very high speeds is better than XC60 and S90. I was a little surprised at that. The Decision ! 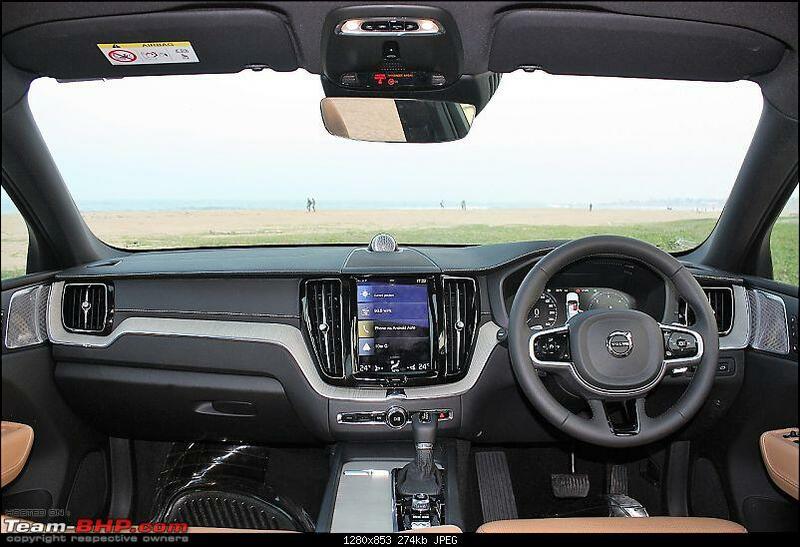 - Driving both cars made me realise the significant difference in power makes XC60 a no brainer. But the dealers are offering up to 10 lacs discount on the S90 which confused me a bit. 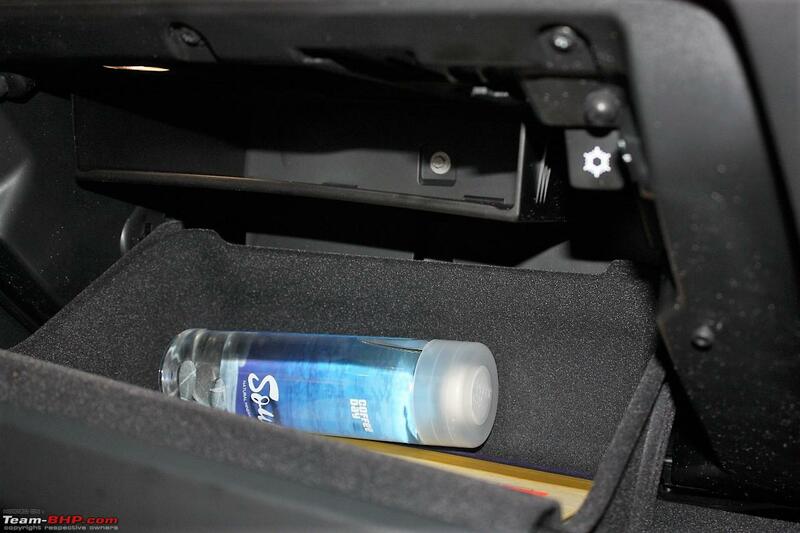 The Xc60 is more practical and more useable if you're going to use this car as a daily driver. Plus in Punjab, SUVs demand a very high resale value compared to Sedans. So it makes even more sense. The only other car I'm considering is the new 530d. I'm going to drive it this weekend and then take a final call. the 530d is a dream for me but after owning a BMW for 5 years now, I cannot live with that amount of discomfort every day. 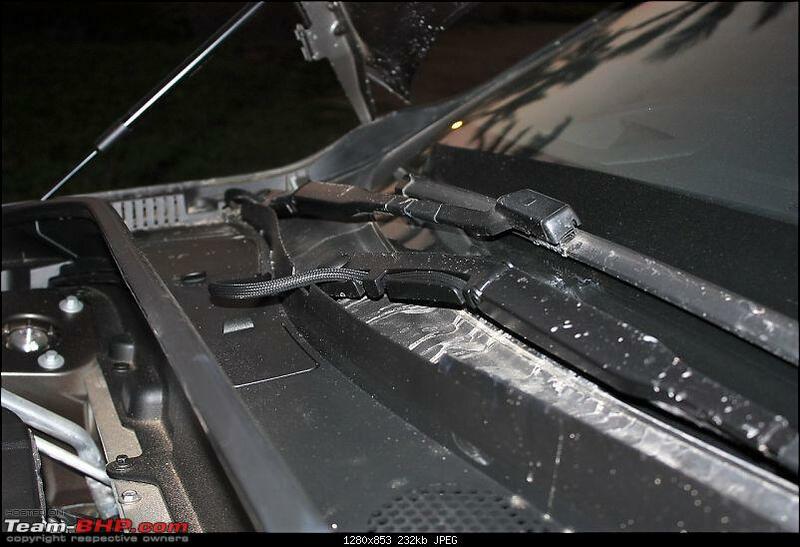 It limits the car's useability. 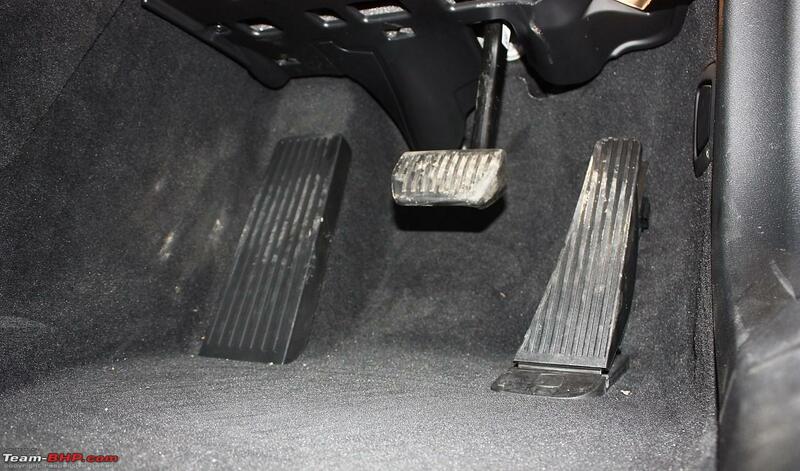 I hear the new 5 series has much better suspension and the adjustable dampers in 530d really work. I'm getting a very good deal on the X5. A dealer is offering an Imperial Blue X5 top model to me for 62 Lacs ex showroom. Thats 13 Lacs Discount !. But the car felt too bland and dated when I sat in it. I'd also appreciate of some good deals/suggestions you guys may have come across below 75 Lacs ex show room. 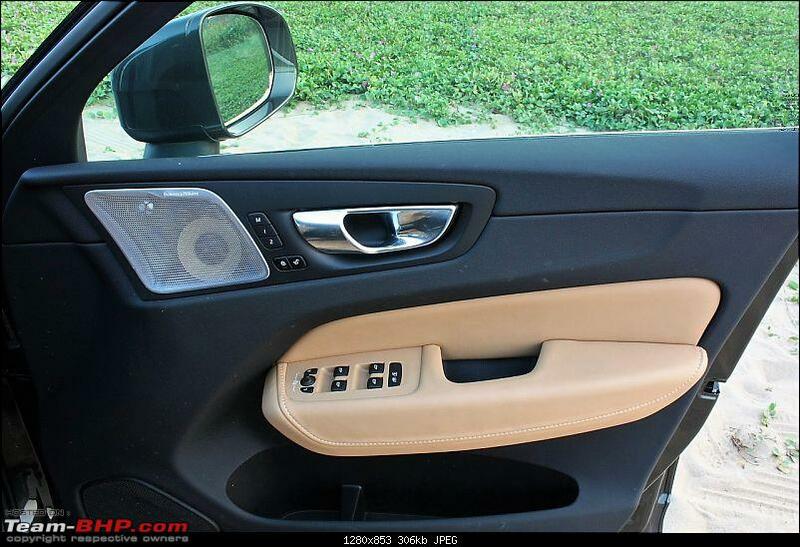 I don't mind looking at the Mustang but again cheap interior and practicality seems to be an issue. 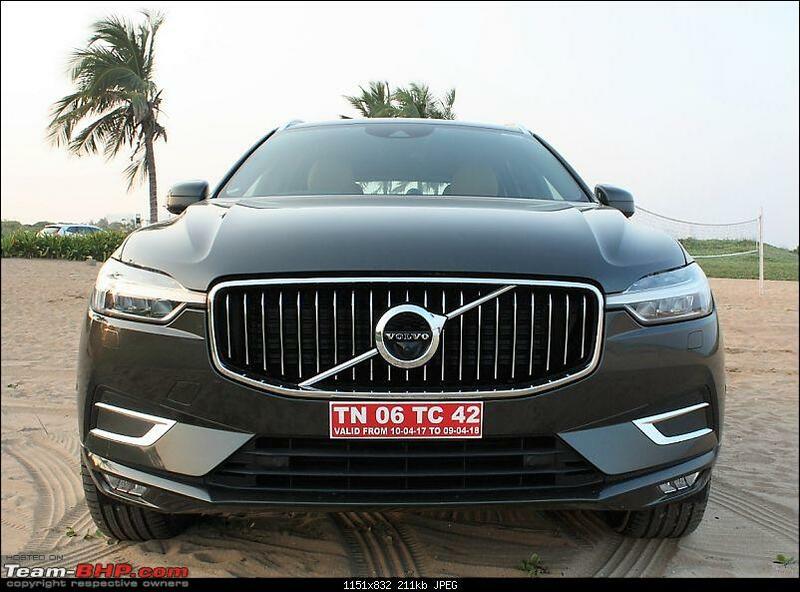 When the XC90 came out I thought Volvo has done a design marvel with that car, especially when compared with super-old previous gen model and also many of its contemporaries. 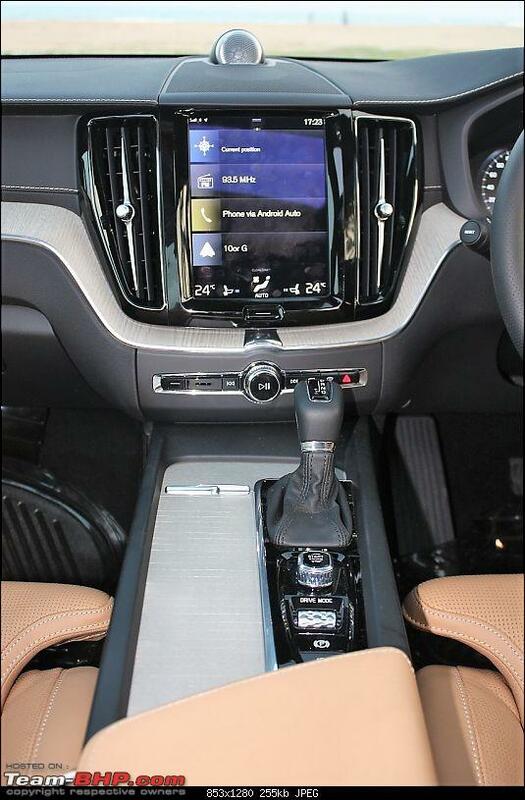 But with the XC60, it just got even better – brilliant proportions, mature yet youthful looks and the whole package oozes class. The usually classy Audi Q5 looked pretty ordinary in front of this. With a bit of dealer expansion and local assembly, I won’t be surprised if Volvo comes up as the main rival for Mercedes in the luxury space. Nicely summed up review. Too bad these are still rare on the streets. In fact, there are more XC90's here when compared to this and not to mention the boring SUV's from Merc. But off late, few are moving away from Audi's and Merc's where the design language is just ordinary. The usually classy Audi Q5 looked pretty ordinary in front of this. Exactly. Our family friend just picked up the XC60 and it shares the garage with an Audi Q5. Got to see them parked together and Q5 just looks more than a decade old. I am still waiting to grab the keys of the Volvo . And I did ask him on his take and he seems to be really happy with his decision. 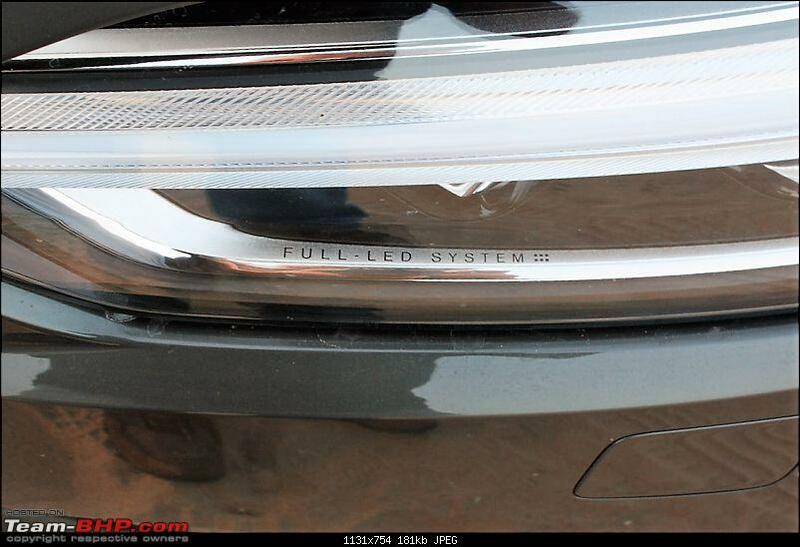 Great review, pilot assist does not need speed to below 50kmph to be activated. I have tested it by engaging at 80kmph and it gets deactivated after 130kmph.